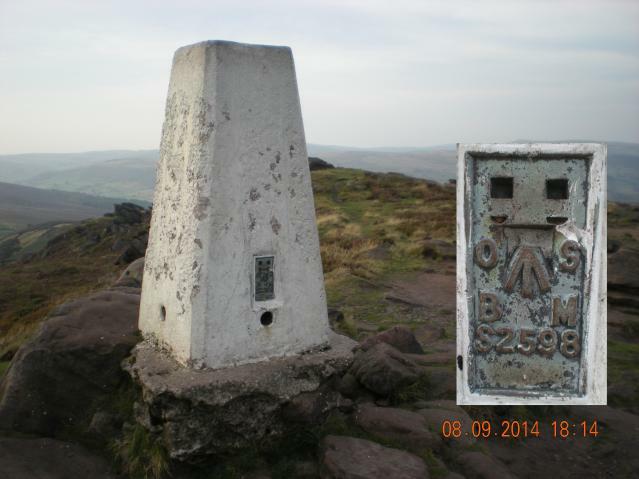 There are 145 photos for this trigpoint (view album). 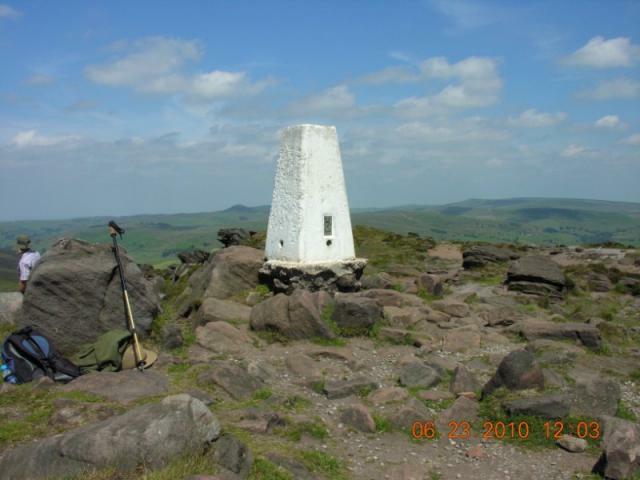 Is ranked joint 795th with 15 other trigs (more). See 137 more in the album. Good views. 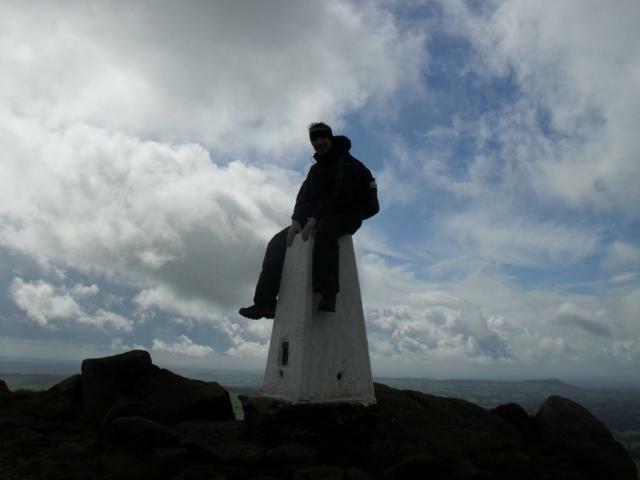 Had to sit down due to very strong wind and then hang onto the pillar to stop myself from being blown over. Great walk in the snow. 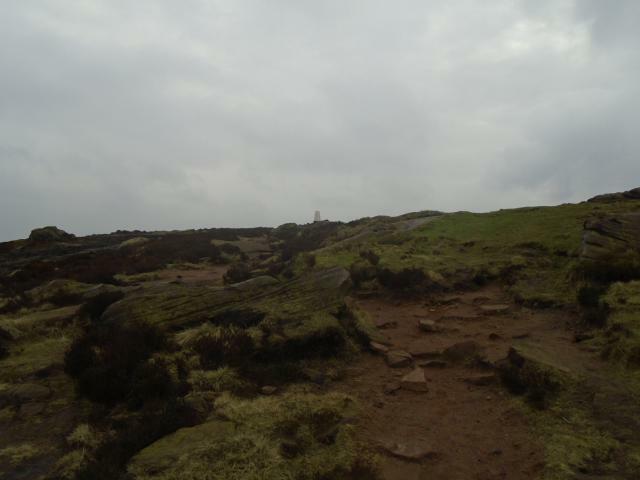 Over the Roaches through Lud's Church then back over the Roaches. 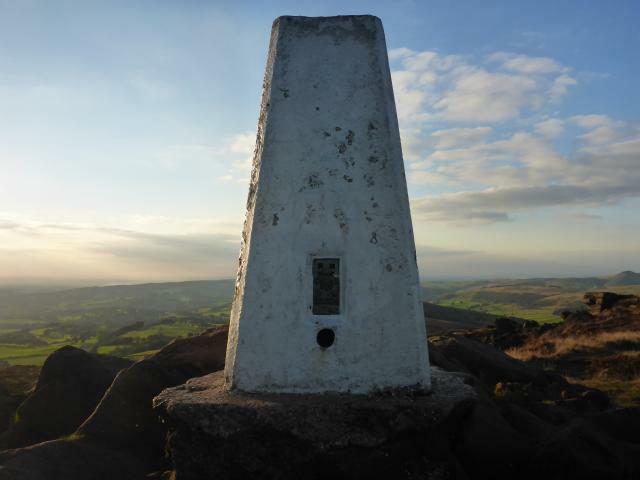 Was surprised I had not logged this trig having passed it many times.Have marked it seven as it brought back memories of standing on it one summer night as sun went down my girlfriend on campsite on Blackshaw Moor. Visited during LEL nav training consolidation. Very windy! 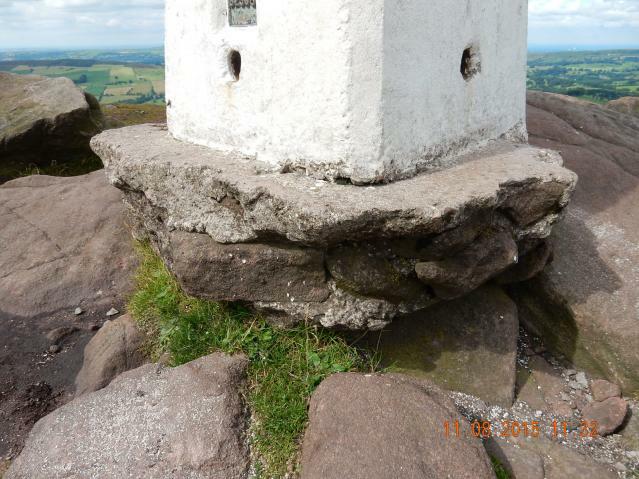 Lovely white-painted pillar atop a rocky outcrop with concrete base exposed all round to about 15". 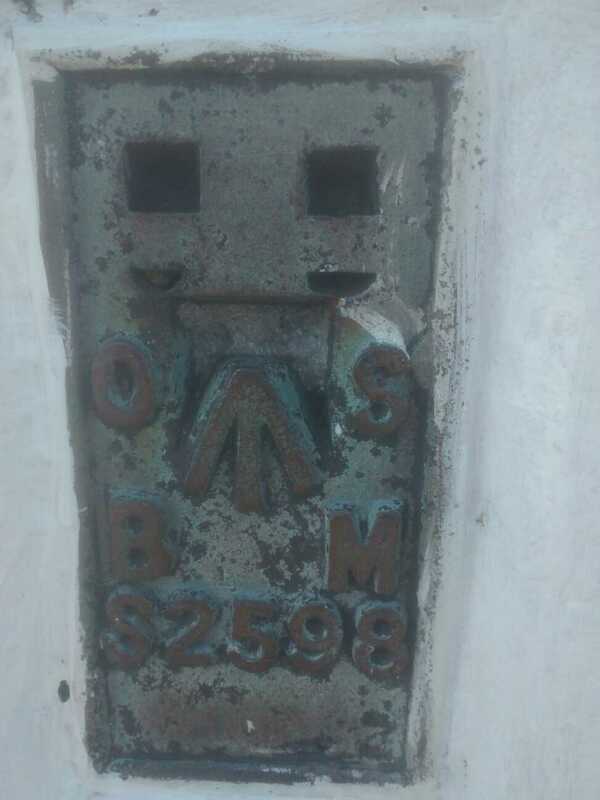 Plug missing. All sight holes open. 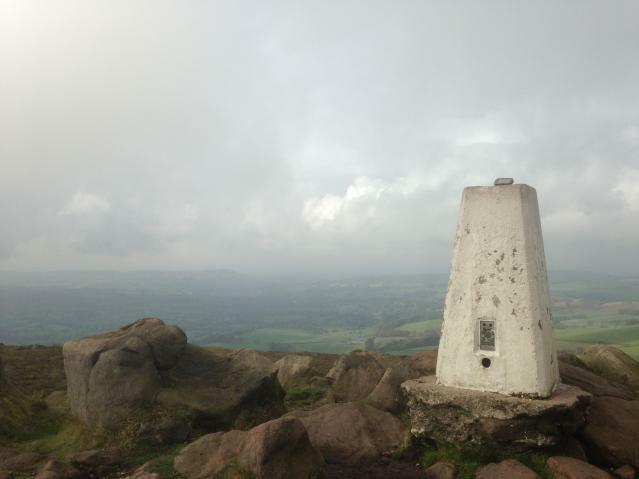 Excellent 360 degree views today. Great spot! 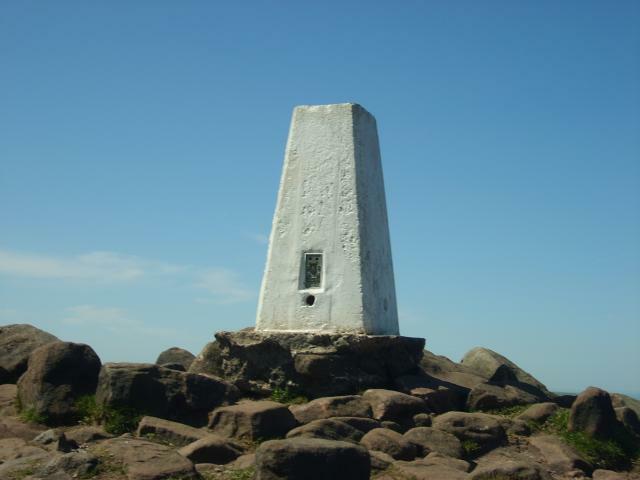 Visited with P61 on 15 Trig day out,amazing top fantastic views best one of the day off to visit Gun now. Revisit its still a great top path has been repaired now trig in vgc spotted the giant BM pivot this time as well. All intact but cap is missing. Recent coat of white paint. 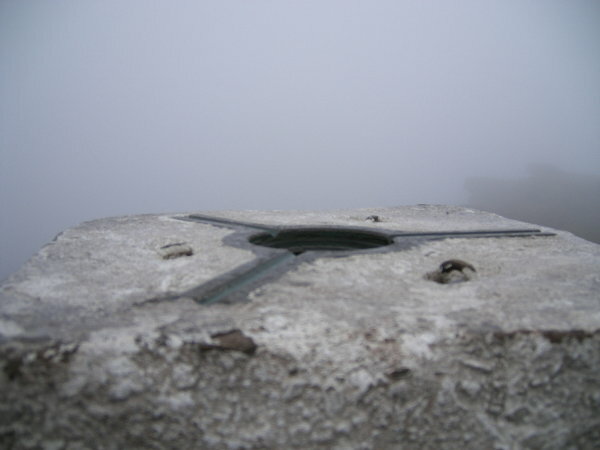 Bet there is a nice view from up here when its not drizzly fog with less than 30m visibility. Main path is being repaired. 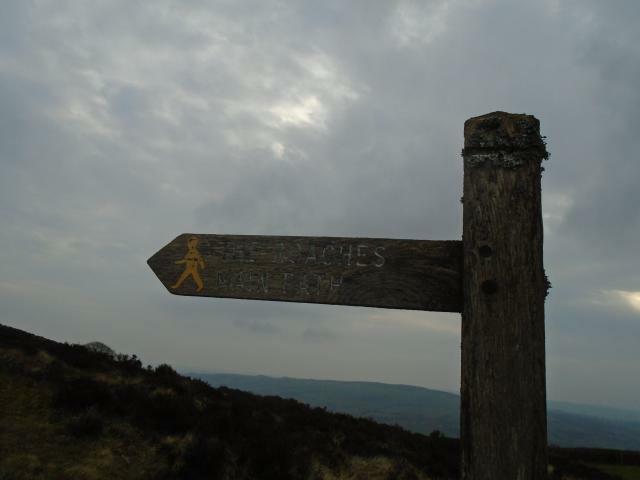 Driving rain and snow at this one on a circular walk from Wincle, out along the tops and back through the valley and woods. 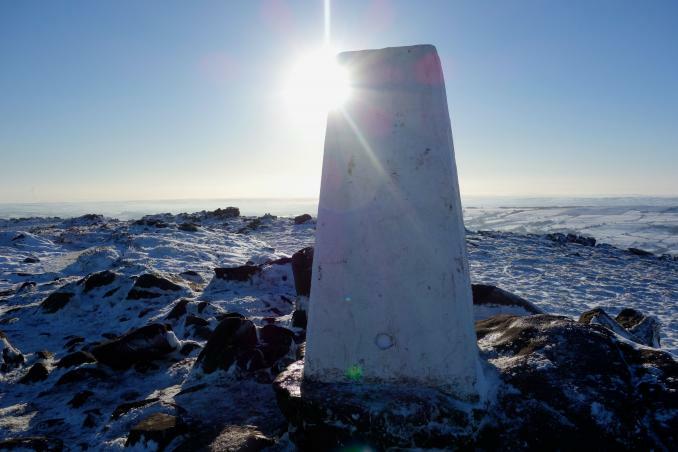 We walked from Luds' Church to Rockhall Cottage, beautiful cold afternoon, snow on the ground and especially in the distance, super views and an outstanding trig. 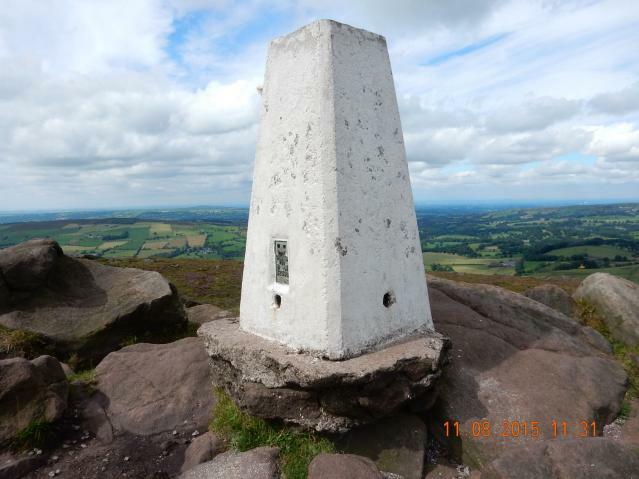 I was hiking with the Coventry University Mountaineering Society when we passed this trig. 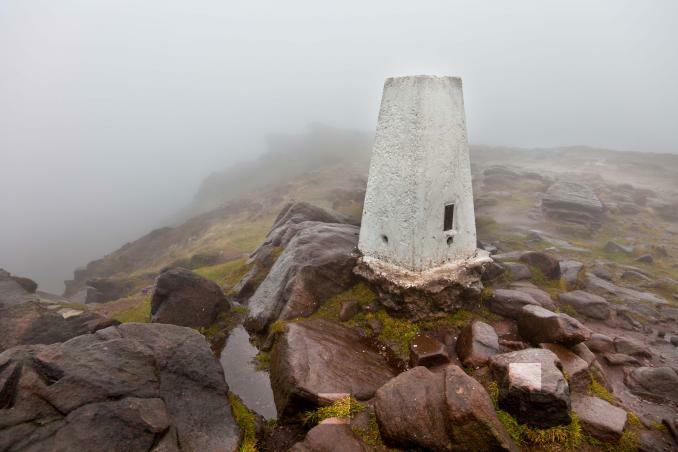 It was so misty, we couldn't see any view at all! 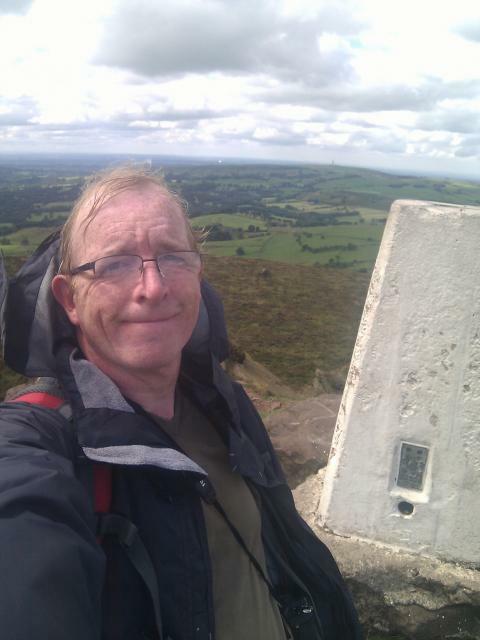 Visited on very windy day, short steep climb from parking area, could barely stand up at trig as blowing 40 mph. 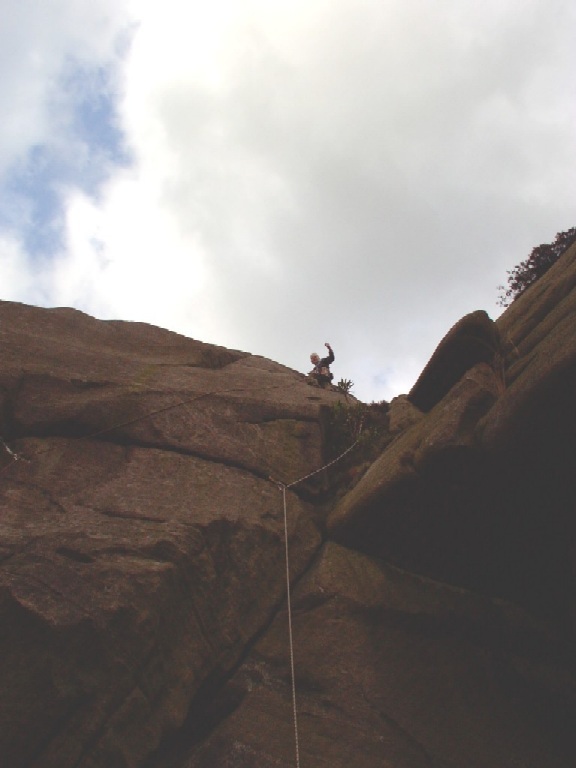 Then on to Lud's Church before returning back along The Roaches and onto Hen Cloud to finish. 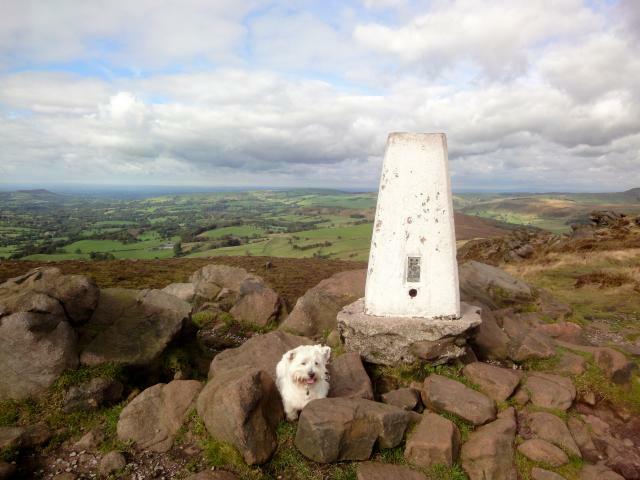 Great Walk, great day and superb Trig. 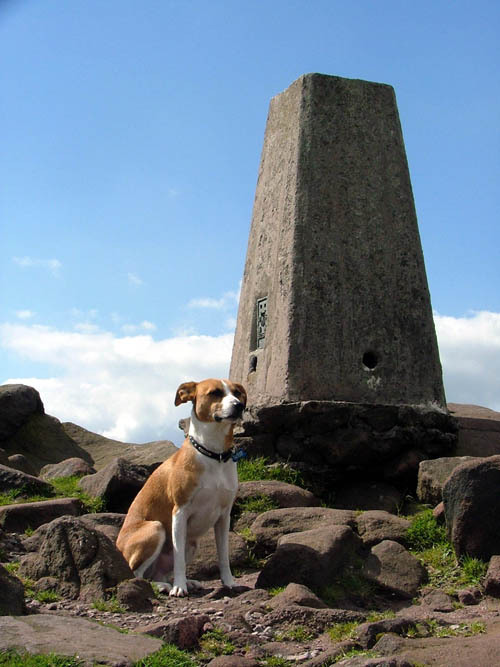 Classic walk along the ridge to claim this trig. Perfect day with long reaching views. From Roach Road after Hen Cloud on a lovely warm day with very good views. 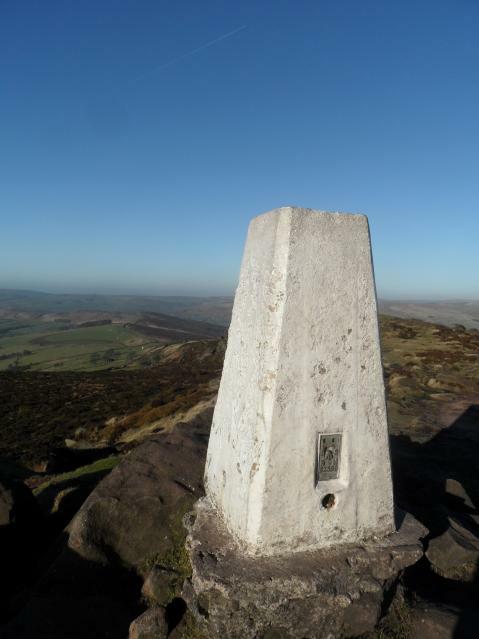 Lovely day, great views. Will be back! Very good day, great views! Nice location. 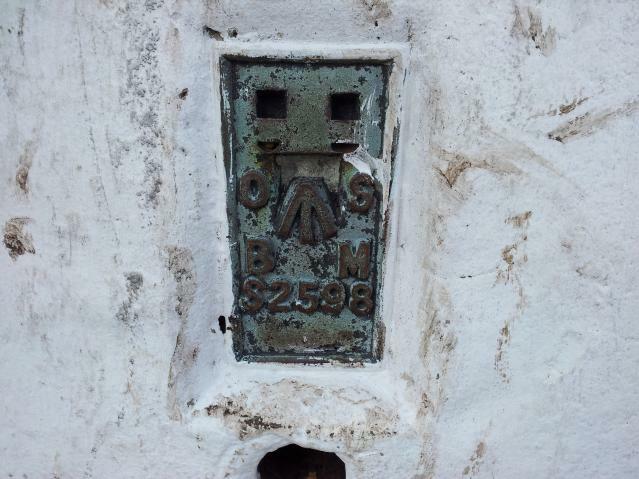 Pillar has exposed foundations but seem solid enough at present; some chipping and general wear on top edges; fairly recent coat of white paint has definitely spruced it up. 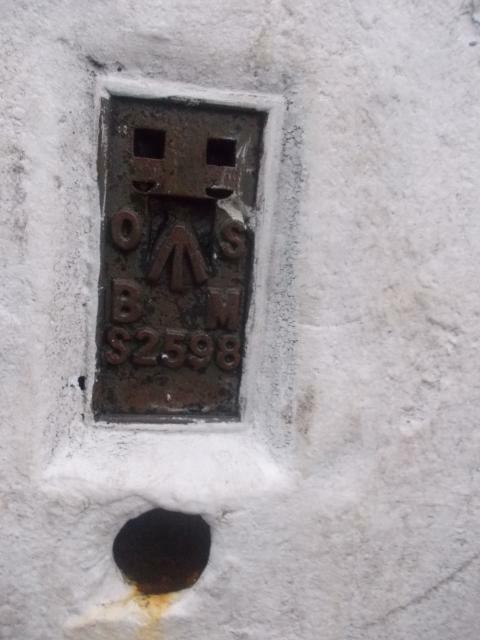 Cap missing, no plug; all sight holes open. Lovely 360deg panorama. Cracking views. 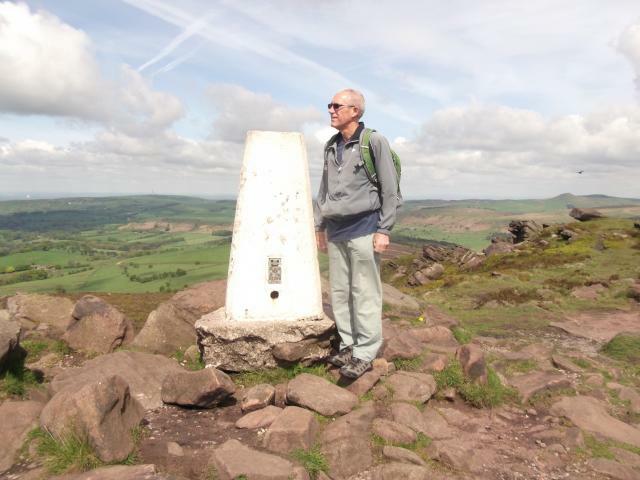 Leading a Staffs Moorlands walk visiting 5 aircraft wrecks in the White peak! Best walk ever, according to one of the participants. 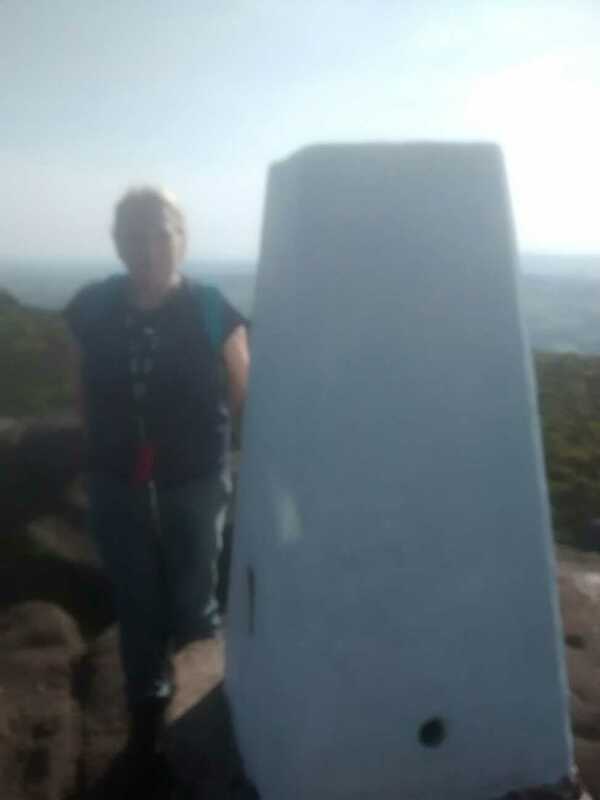 Been to this trig a number of times before! 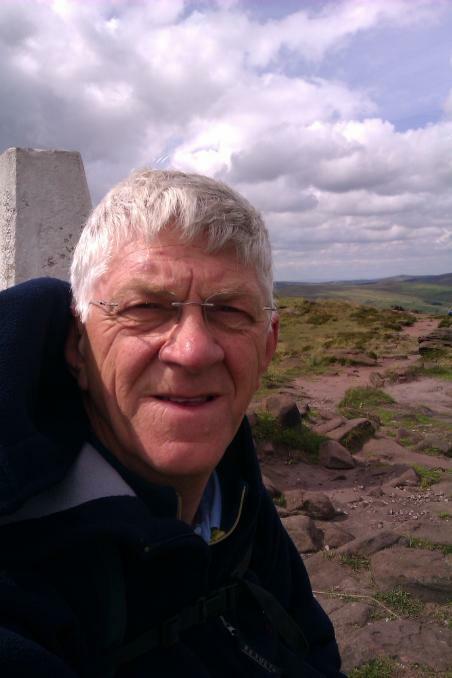 The Old Man's birthday and a wonderfully sunny, breezy day for a circular walk round the Roaches and Lud's Church. 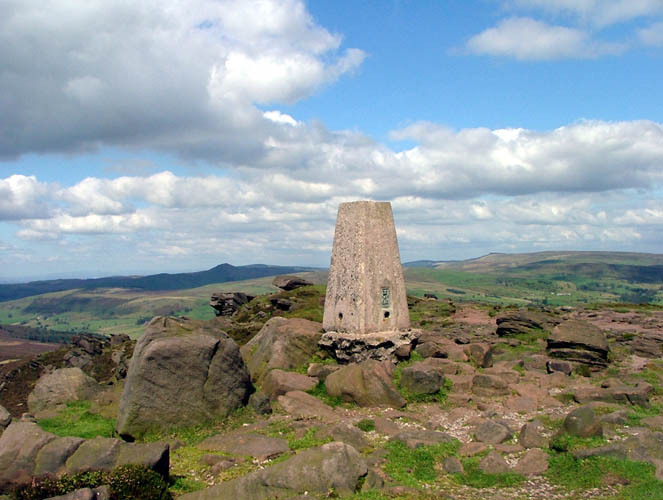 Quite busy at the trig, but cracking views all round, an excellent day. 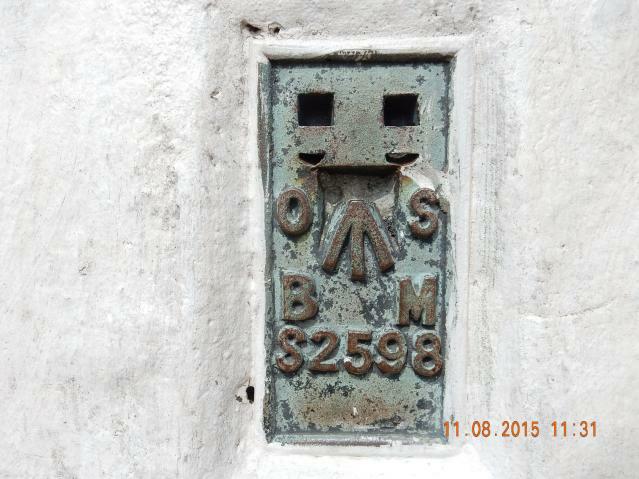 All s/holes, and centre, open, but otherwise in vgc considering its very public location. 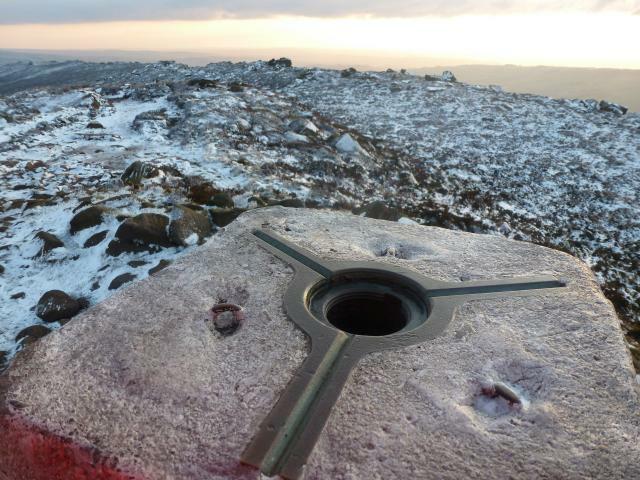 Cracking views up here today in the snow, particularly to the west and south west where the landscape really opens up. 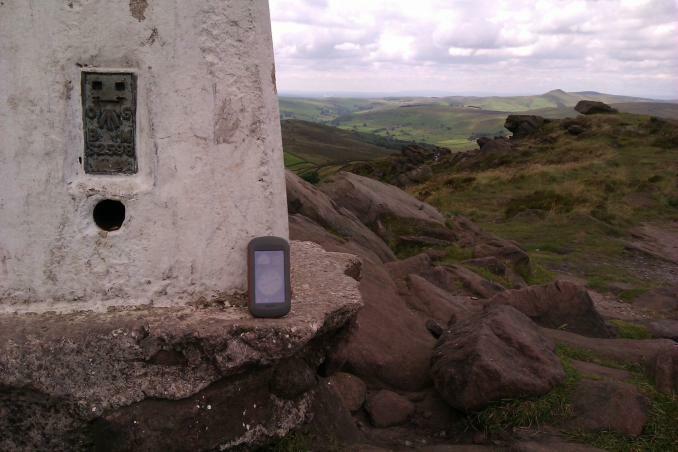 A walk along the roaches geocaching, terracaching and trigpointing, excellent day for a walk, could see for miles. 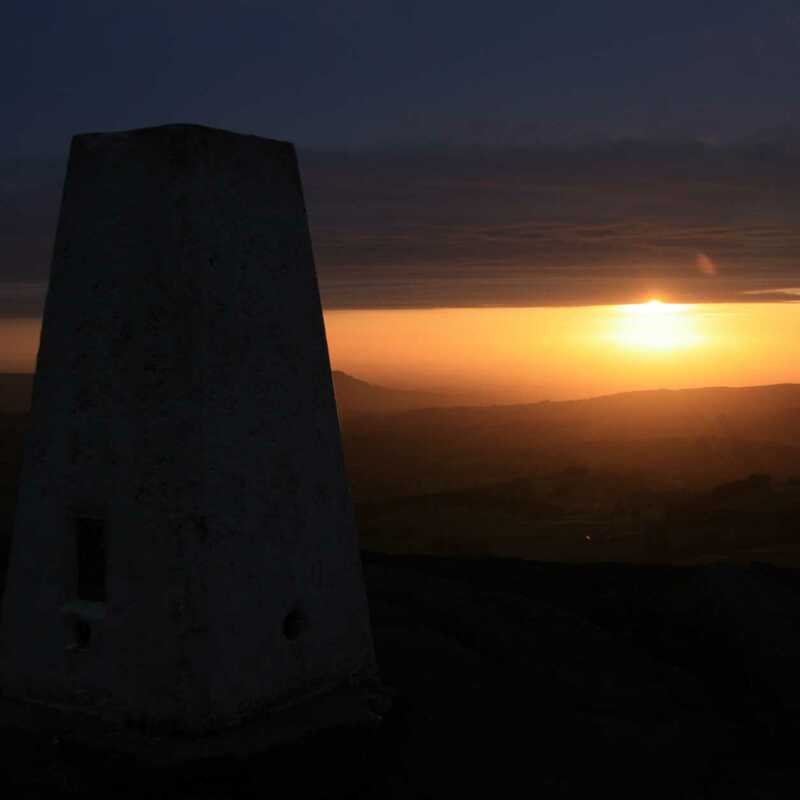 Nice evening stroll to this one from the north west, no one around, great views nice area. Pillar good condition, cut benchmark in nearby rock. 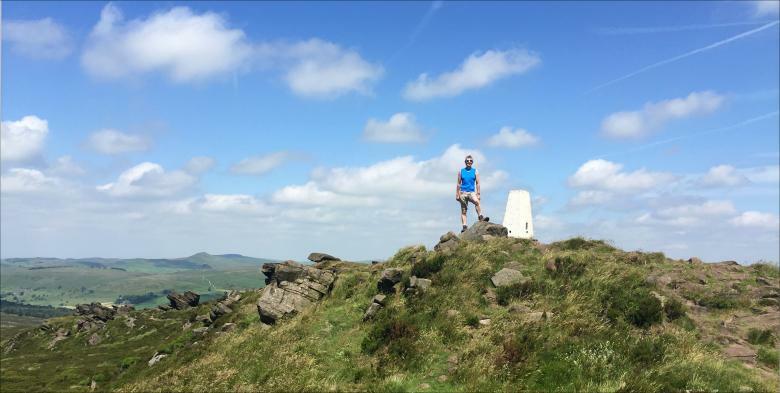 Came up from Gradbach via Luds Church and the Ice Cream van at Roach End. Great day with far views! 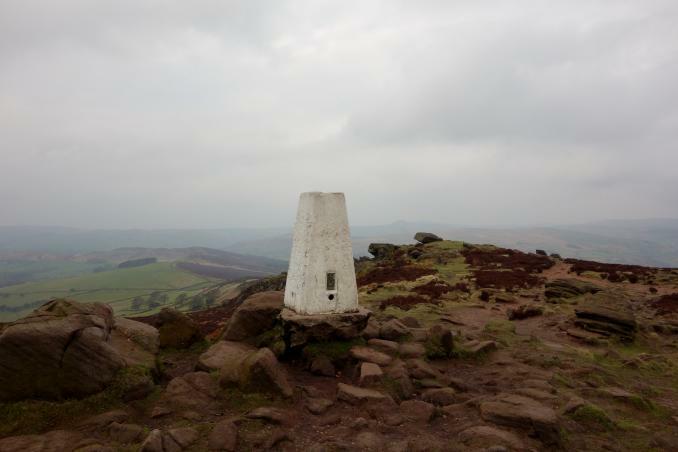 Visited while walking along The Roaches.View a bit hazy today but could still a long way. Early morning visit as the remains of a cloud inversion burned off. 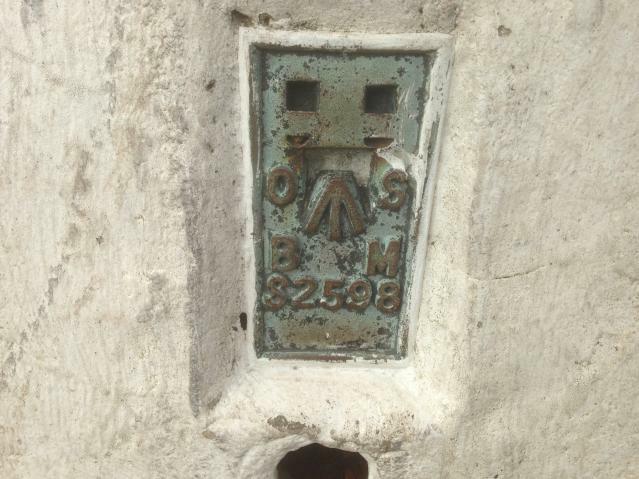 This was one of those classic moments that make all those grotty pillars worthwhile. 10 out of 10 for sure :-)) . Fantastic day. Walk long but not too strenuous. Ludd's Church was well worth fisiting and was really spectaular.great weather sunny. Excellent views but a little hazy on the day. TP -spider intact but plug removed. 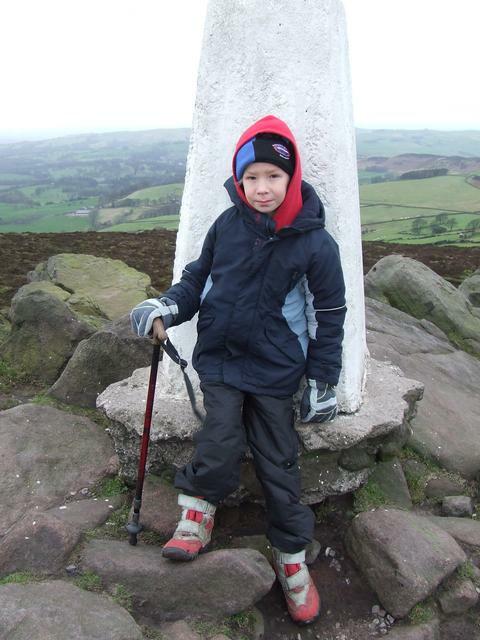 Cor its windy and cold up here today. Good views. Ascended up from Gradbach via Luds Church. 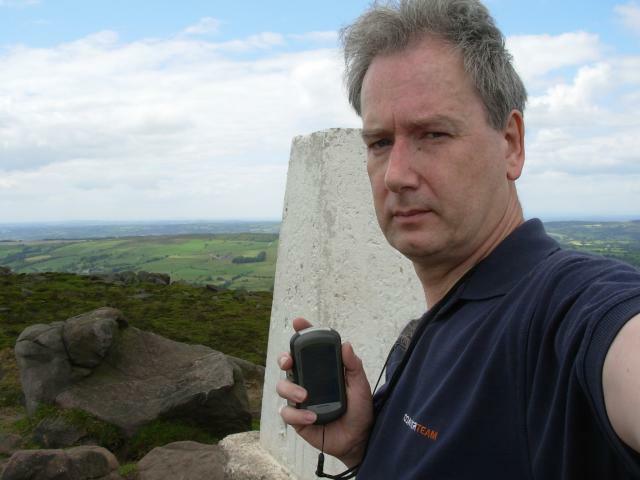 Trigs platform is looking a bit vulnerable. Good views, with Imperial College Fellwanderers. 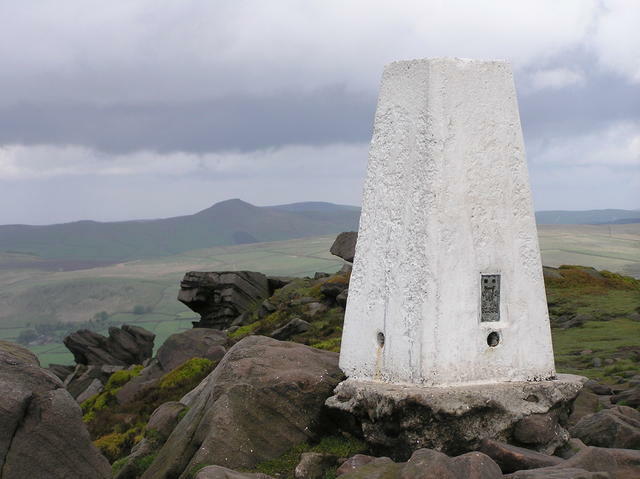 Visited this during the Passing Clouds Fell Race. The route didn't take it in, but i took a detour! 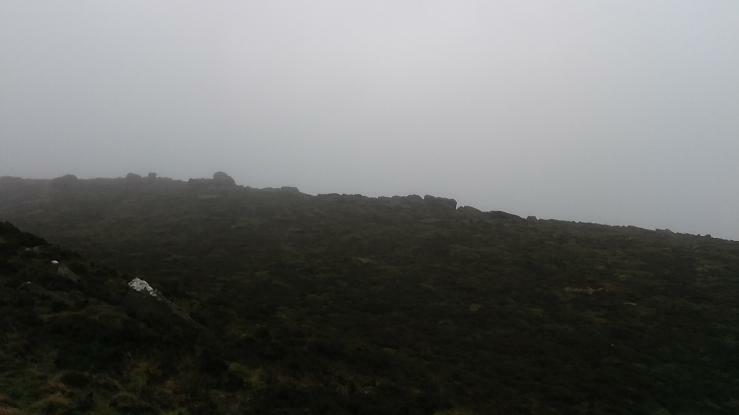 Wet and Wild day for the crossing of the Roaches. Third and final trig of my holiday week. Obviously a classic and very popular area. 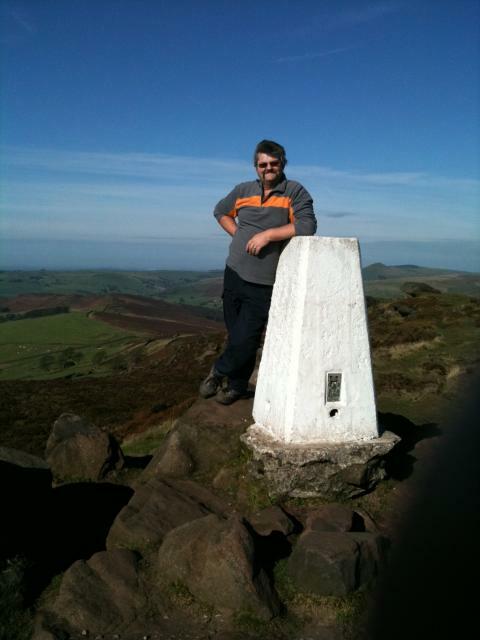 Lovely walk up, parked on a layby near Hen Clouds then walked along the ridge. 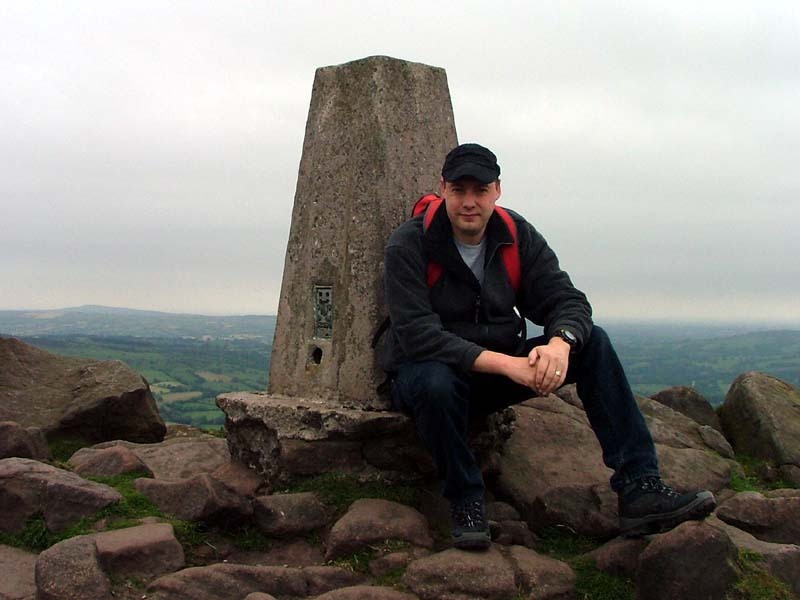 A clear day so I could see the mountains of North Wales. 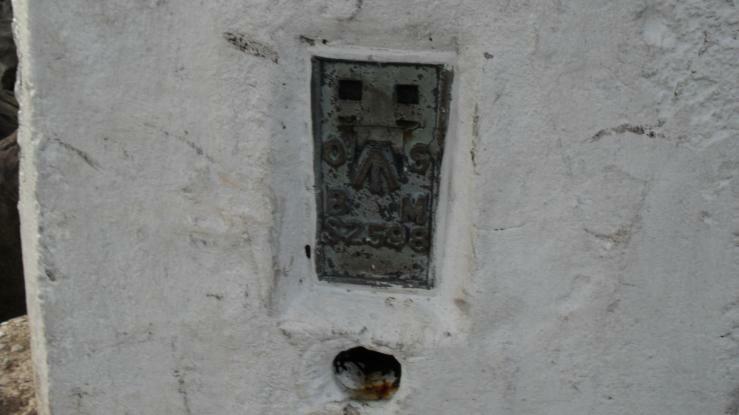 Missing plug, fading white paint on the pillar. Been here several times before, usually after climbing on the Skyline area. 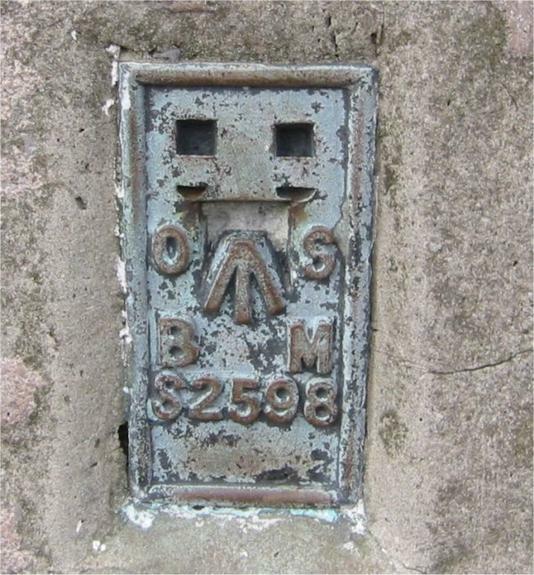 Second trig of the day and again found whilst geocaching in the area as the YOSM has visited this one. 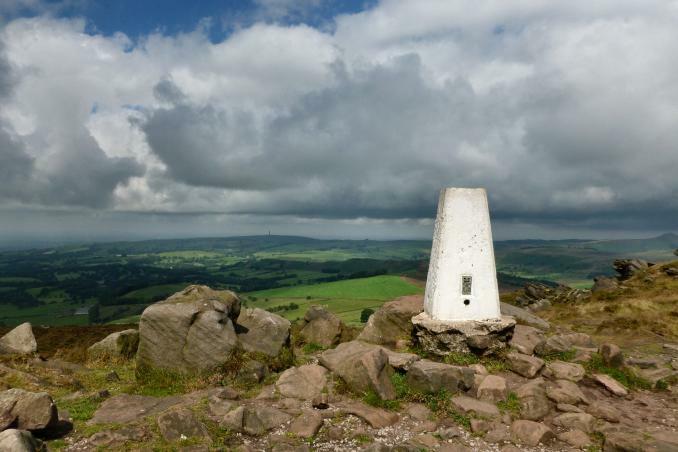 Superb walk up to this one and rewarded with splendid views. 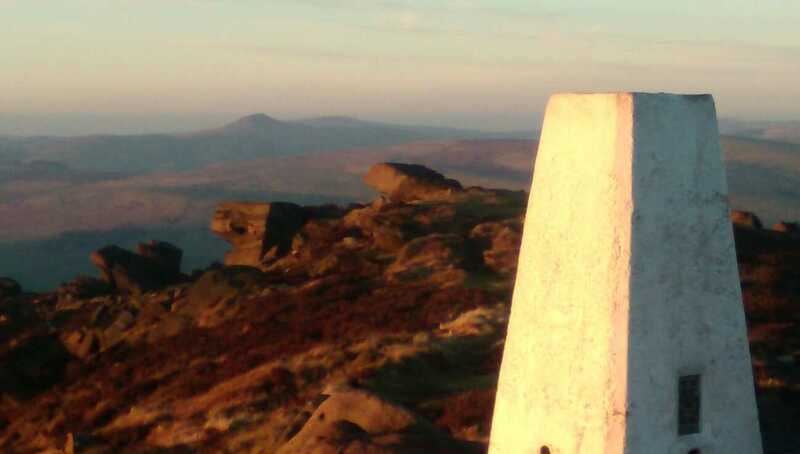 We could even see Shutlingsloe that we had visited earlier this morning. Again with fitzydan,second of the day whilst caching.good walk up with stunning views on this now sunny day.well worth the effort! 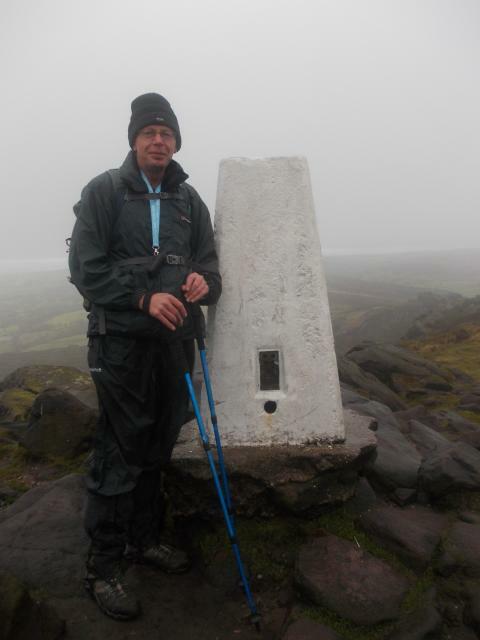 It was a windy damp day but enjoyable. 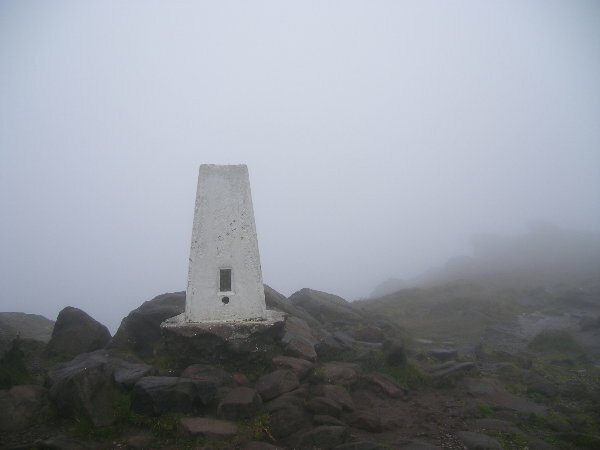 Unfortunately the cloud came down just before we got to it so we didn't get a view from the top. 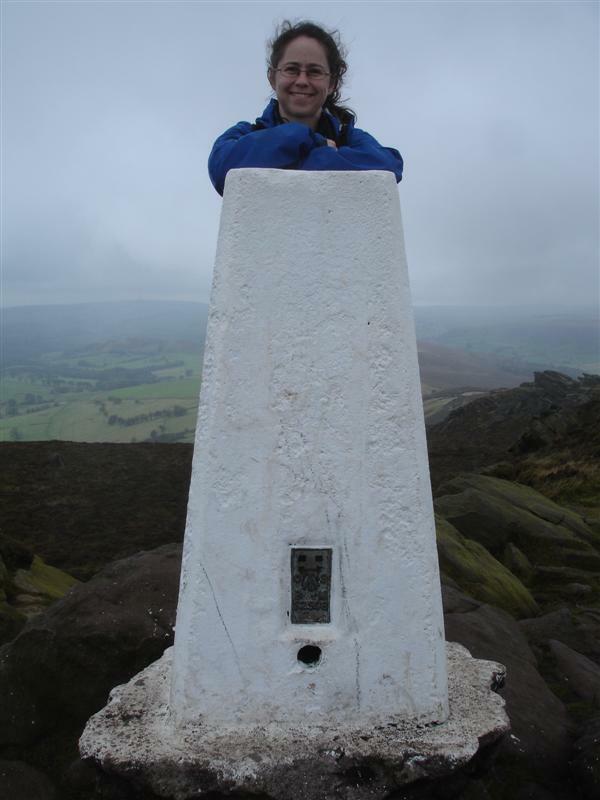 Big Fish and MicroFish are up at Flag for the first Geocaching winter camping event and have come across to the Roaches for a spot of Trigpointing and caching. We walked up past Rockwell Cottage, luckily the weather wasn't too bad today. 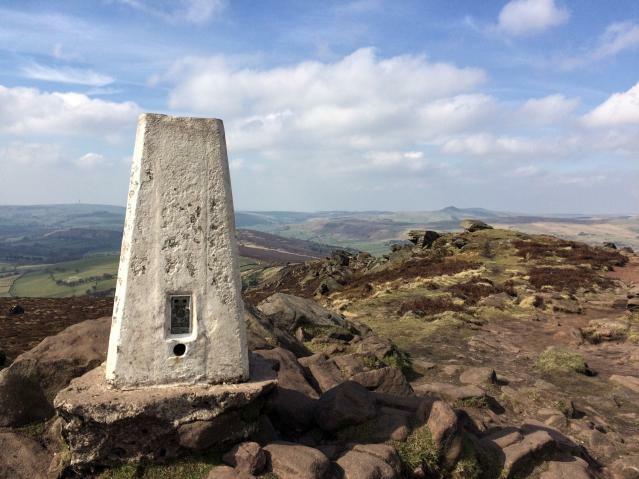 The Roaches Trig & MicroFish. 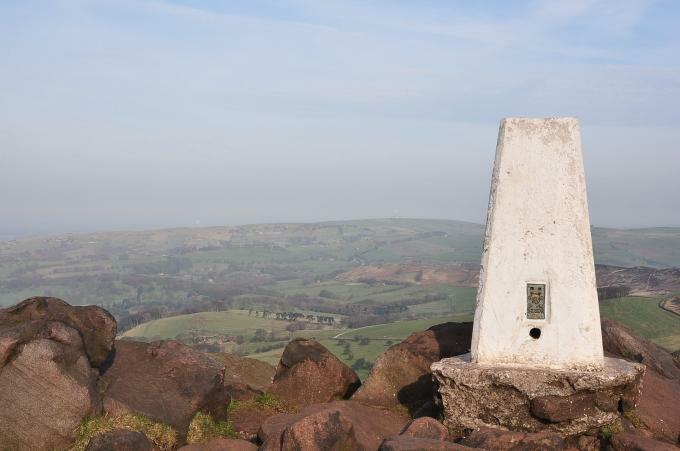 Can't be many more "long 'ens" to do in The Peak District for me! 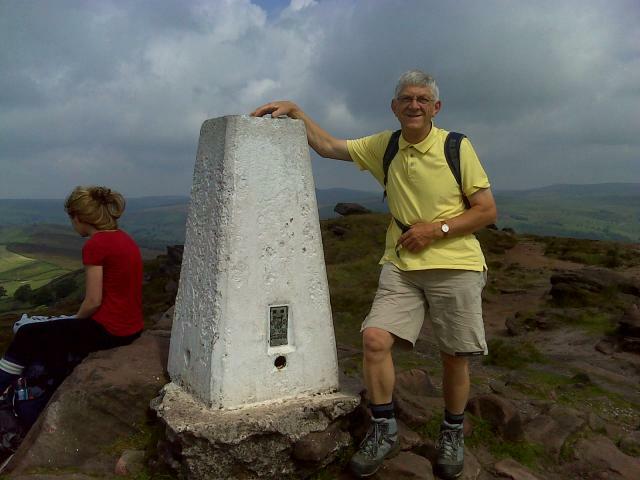 The joy on retirement - being able to park at the Roaches on a sunny day. Made the mistake of taking the Hen Clouds path first, before realising this is up and down for no reason. 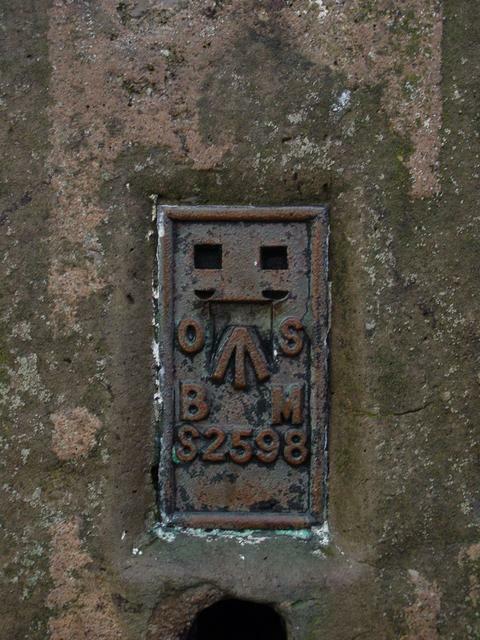 Little sign of climbers on here. Congratulations I guess for leaving the birdies alone. Second attempt started with a bit of a quogmire, but a little better on the top. Still few climbers. Fewer still wallabies. (None!) Pillar one of those ones you can see from a distance, and refuses to get any nearer! Nearer caught by sunset, but put on a spurt and managed the lovely Lazy Trout in due course. 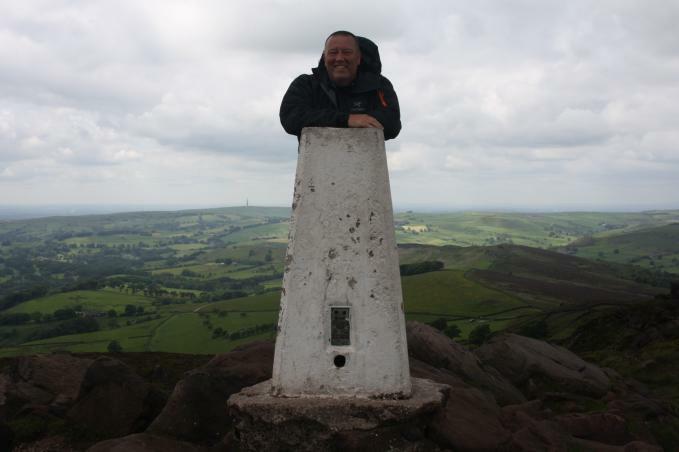 Second visit to this pillar, whilst Assessing Silver DofE Expedition Teams. Weather cool and windy this time, but views still spectacular. Awesome clear day, again we could see for miles, Somewhere we came because of geocaching yet again. 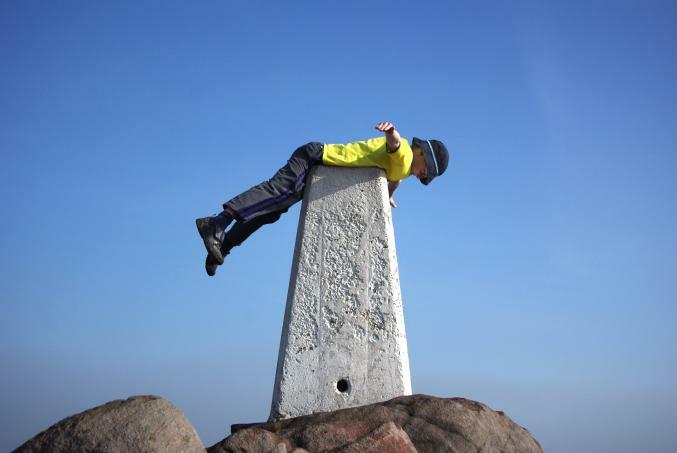 Super up here today with good clear all round views. Well worth a visit. I last came here when I was 12 in 1982. Its great to be back! 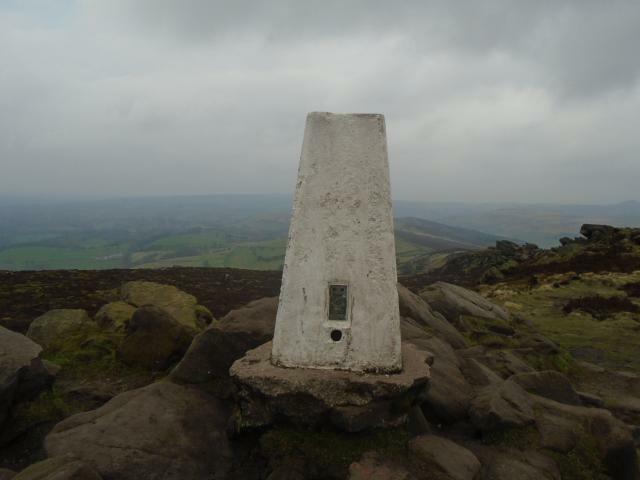 Had not been to the Roaches since climbing days, and had never visited the trig. Pleasant spot. 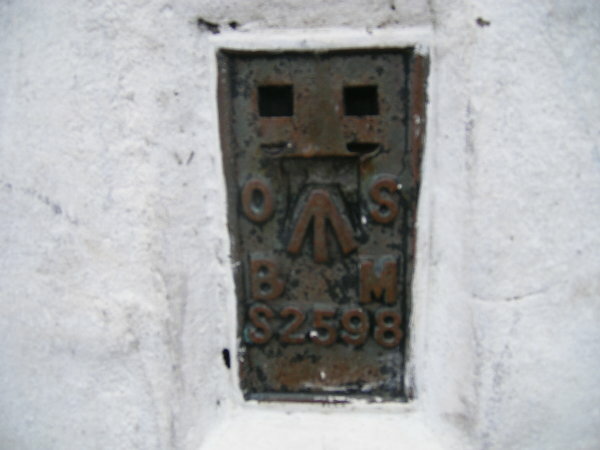 Large benchmark on rock 2m away. 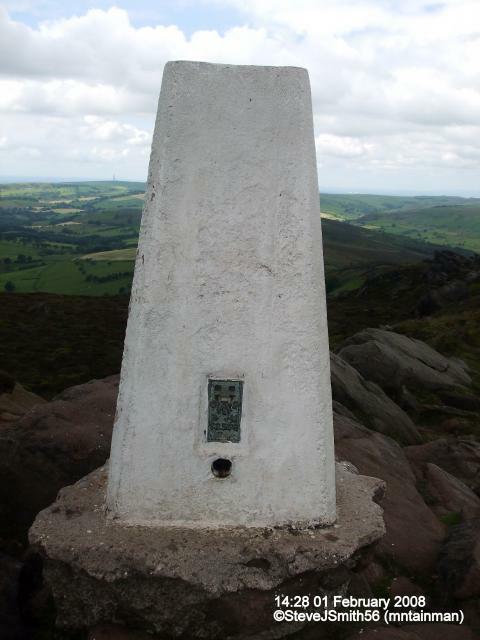 The Roaches Trig and large benchmark. 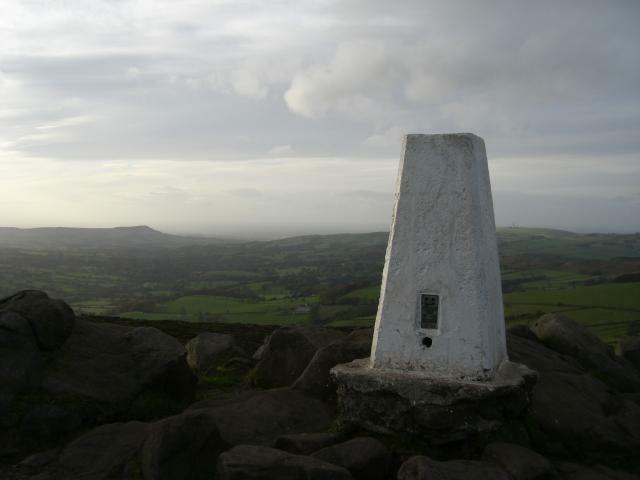 Climbed HVS7a to trig only joking good parking and path at roach end of excellent views lots of tors on way, trig in vgc plug missing. 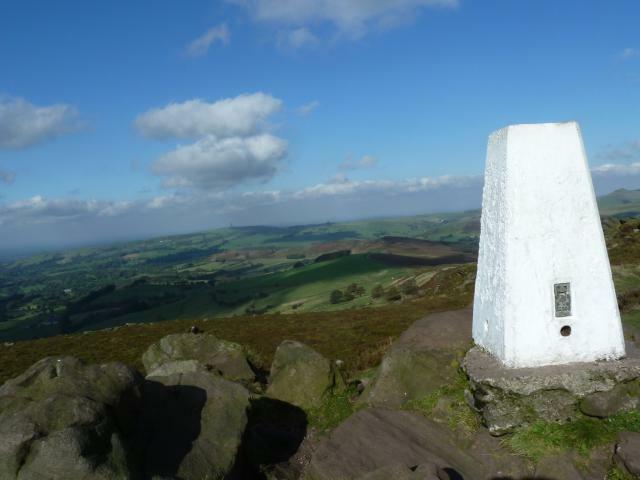 Nice day for a walk over the Roaches - fine and sunny. 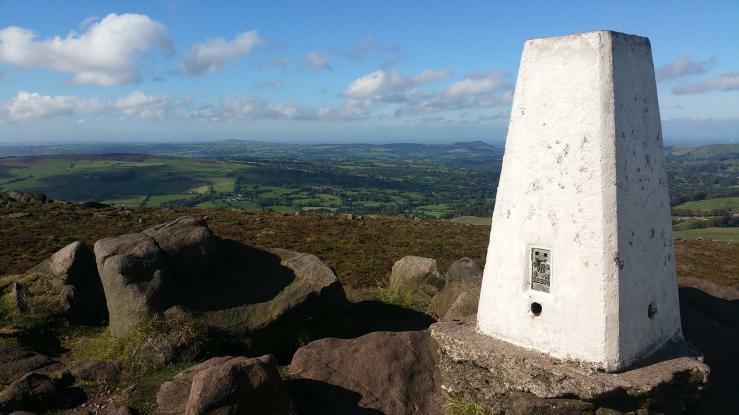 Followed the route in �Peak District Trigpointing Walks� Parked in the lay by and climbed Hen Cloud then on to the Roaches � continued through Lud�s Church and past Swythambey Hall to Gun Hill. 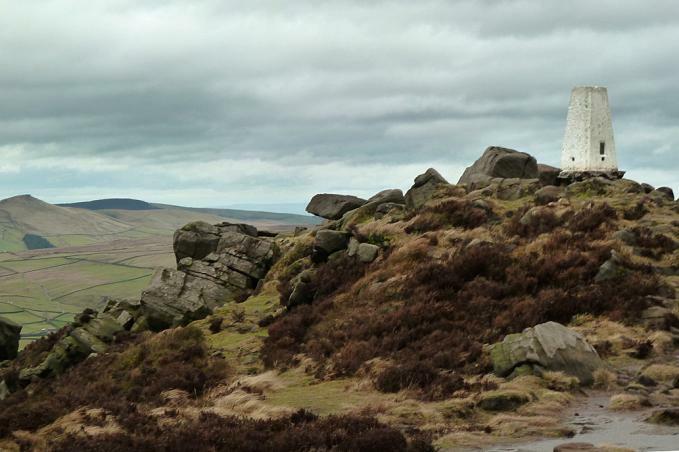 Very impressed with Lud�s Church well worth a visit � one of the best features in the Peak District. 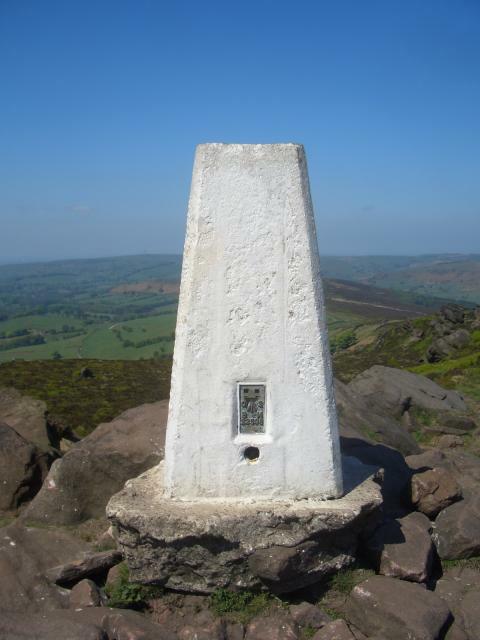 Good views from the trigpoint on a hot humid day. 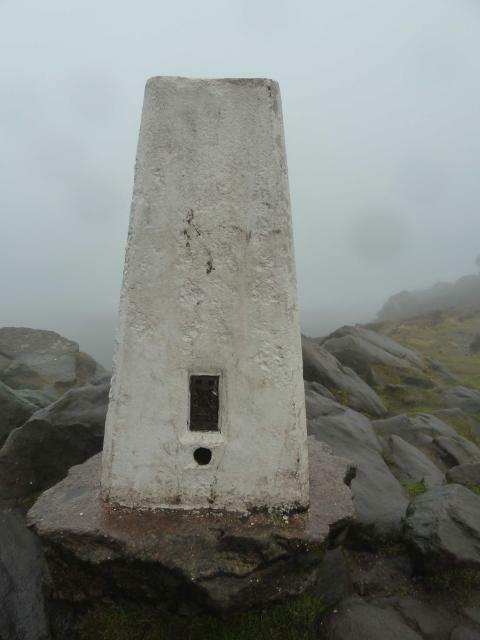 Passed this trig on a group walk in wet and misty conditions. 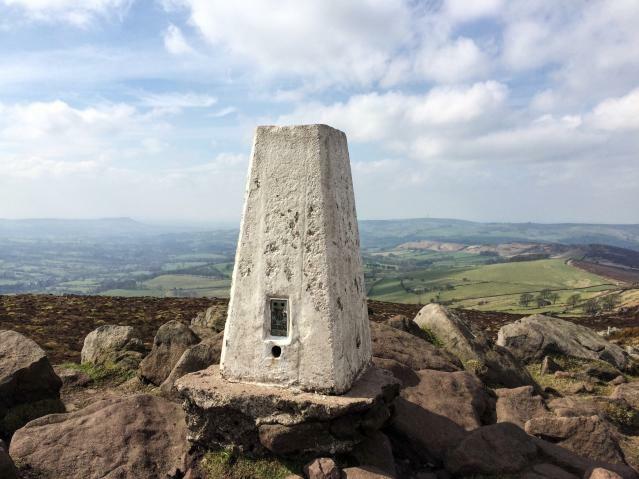 Visited whilst Assessing Silver DofE expedition Teams. 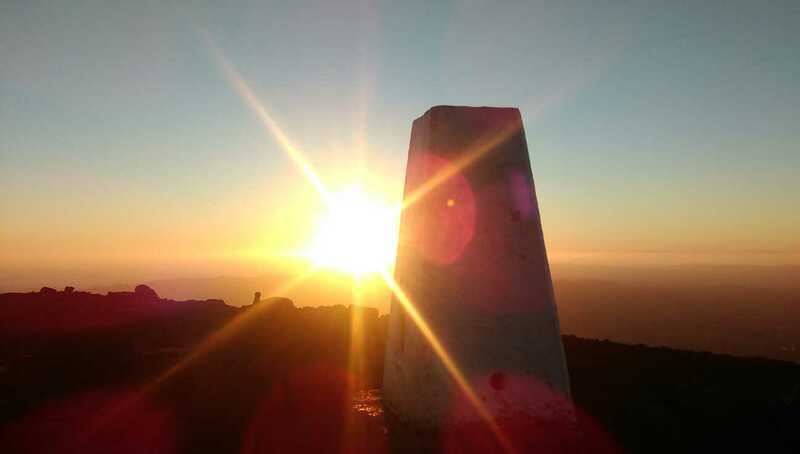 Weather brilliant, as are the views. 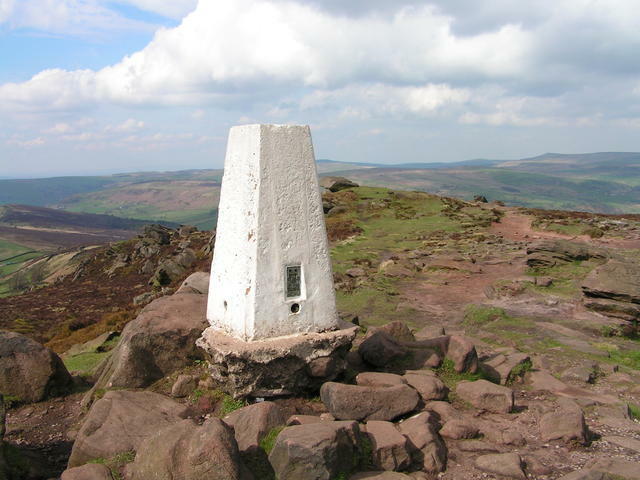 Parked at Roach End & strolled up to pillar. 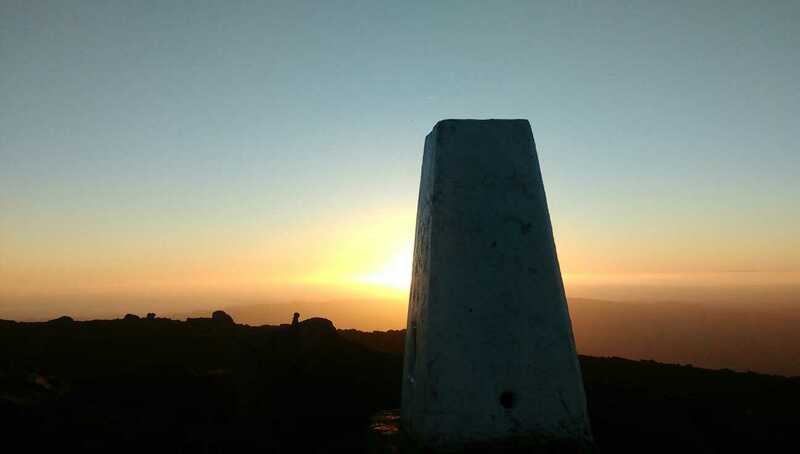 Views over to Jodrall Bank. Pillar quite undercut. 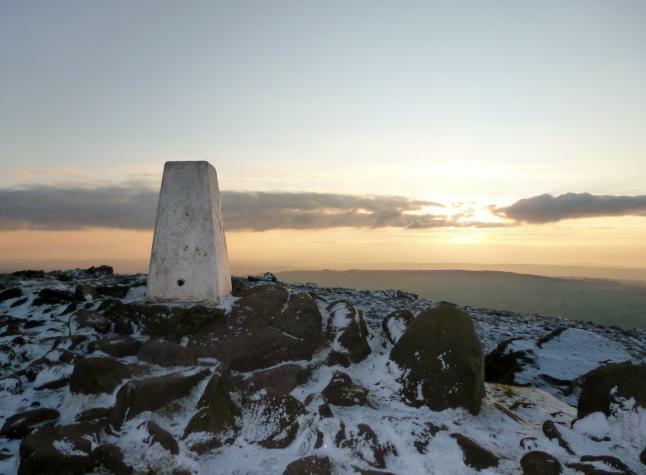 Great walk along the ridge to this. 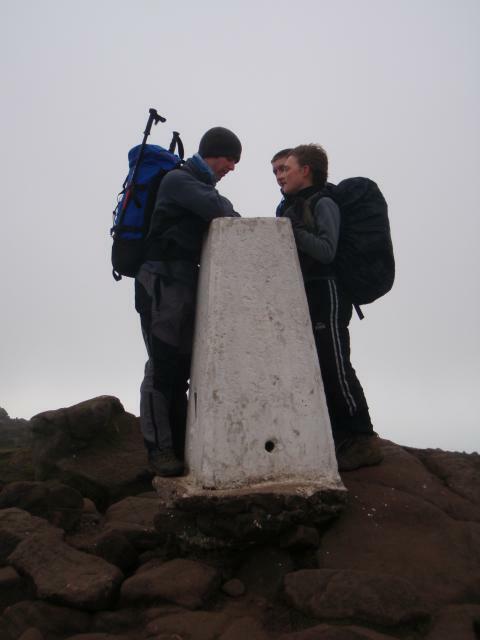 First of four visits this week escorting Y9 pupils on their annual hike and camp. 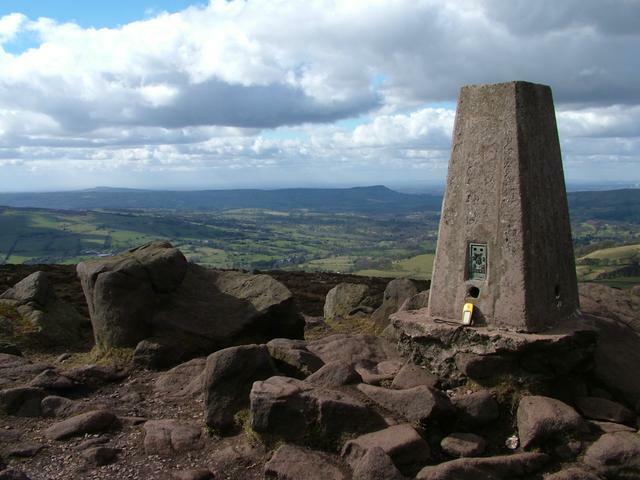 They go from the A54 just short of the Cat & Fiddle junction via Gradbach (o/night) and onto the Roaches to Tittesworth. Some good navigators, but some clearly terrified/bored and struggling. No plug. Public. Access Land. 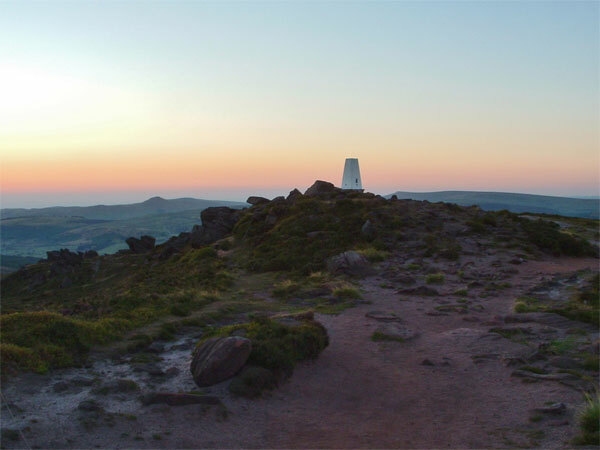 Peak District National Park. 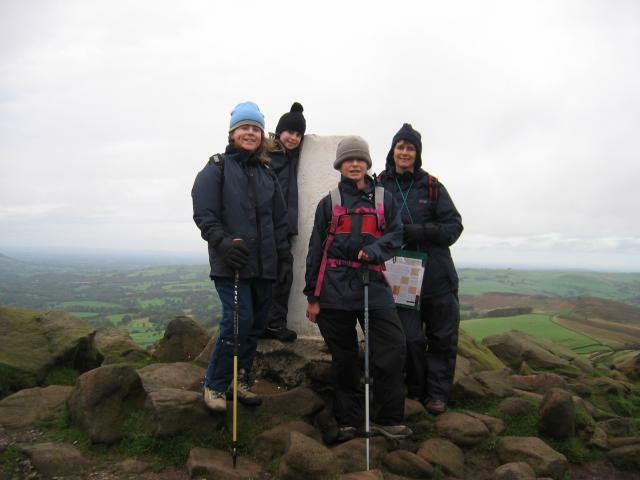 Ascent from north - Roach End - before embarking on magnificent ridge walk along the crest. Rough going in places, but fairly straightforward. 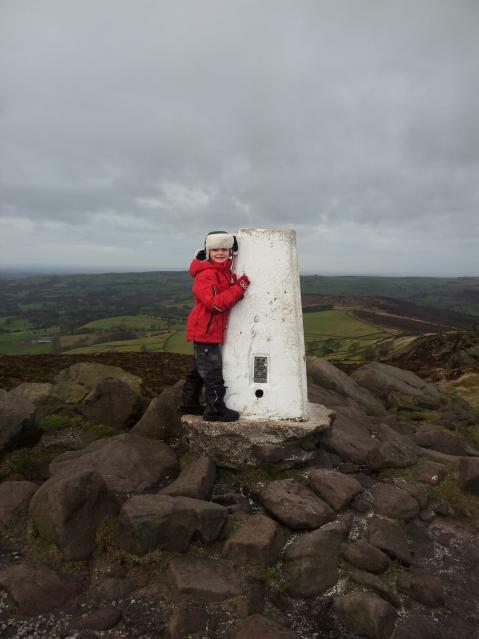 Superb location for a trig pillar. Fantastic views and weather that you would hope to experience in the south of France. 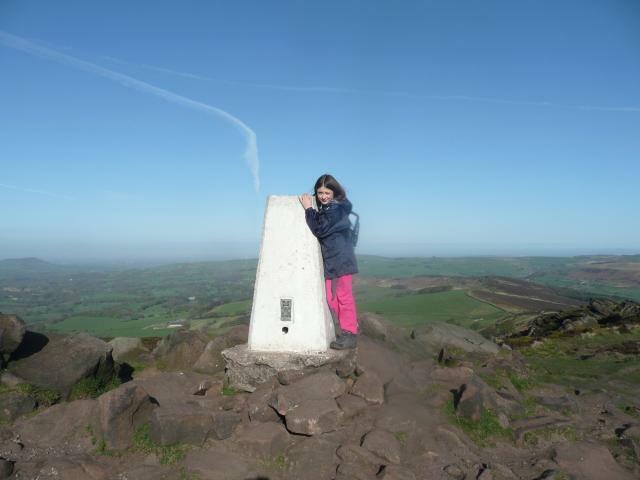 managed to drag my daughter on a sponsored 10 mile hike along the roaches and through gradbach woods,she did really well although we had many drink breaks!grand views from the roaches,always a nice place to visit but nice and early away from the hoardes that infest the summit later in the day!!! Another white one. 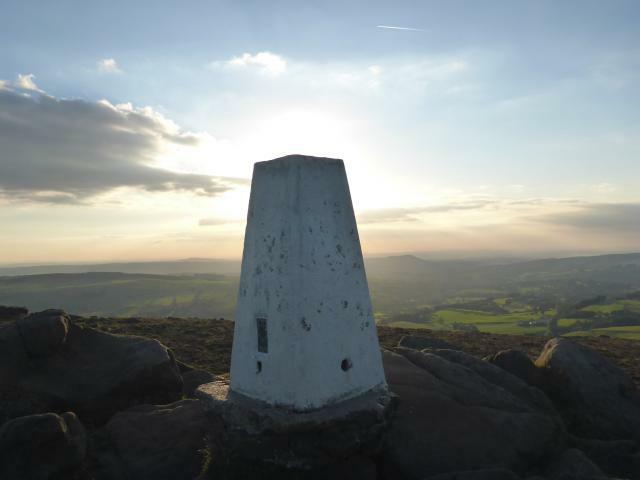 Superb views, as the sun was going down, all around including the Cheshire Gap. Arrived after visit to Lud's Church. Lovely weathered rocks on the approach. What a pity I missed Chingwakabungya by less than three hours. 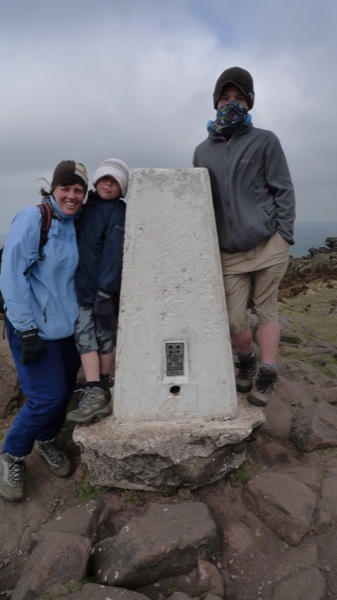 Fantastic views in all directions, really enjoyed the location. 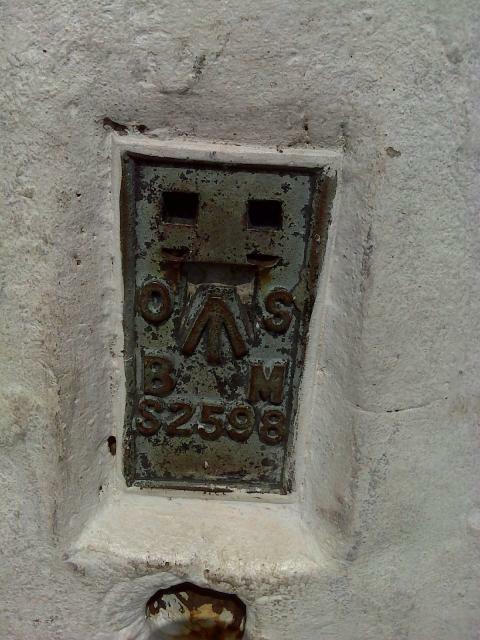 Also found the nearby Geocache. 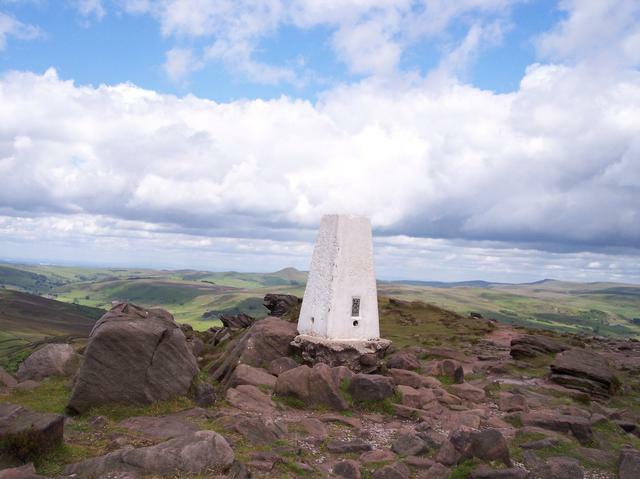 Expansive views all round and well worth the visit. Could see Jodrell Bank in the distance. Strange pond,Doxey Pool, further down the path at 004628. How did it get there? Nice walk, shame about the fog ! 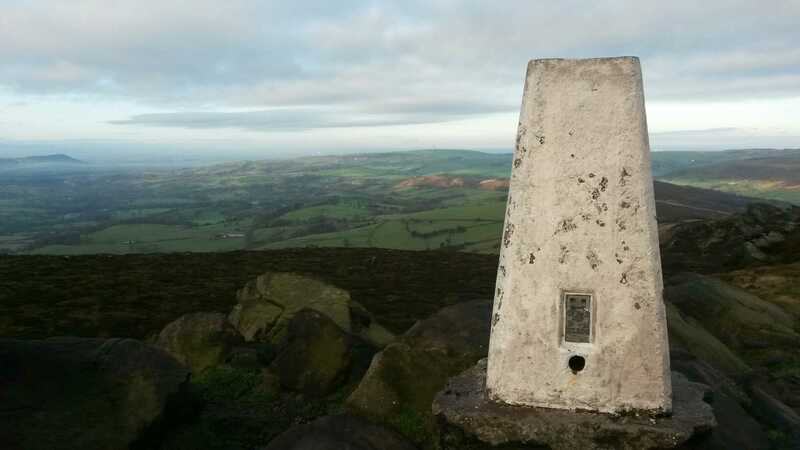 Another great trig in this area bagged. 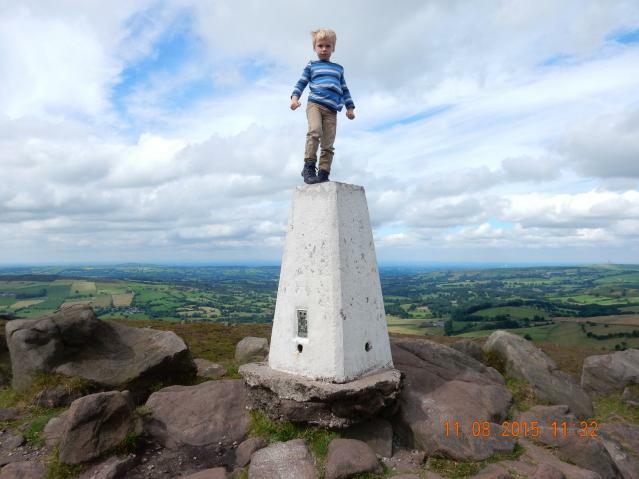 My first time on �The Roaches� but I don�t think it will be my last. 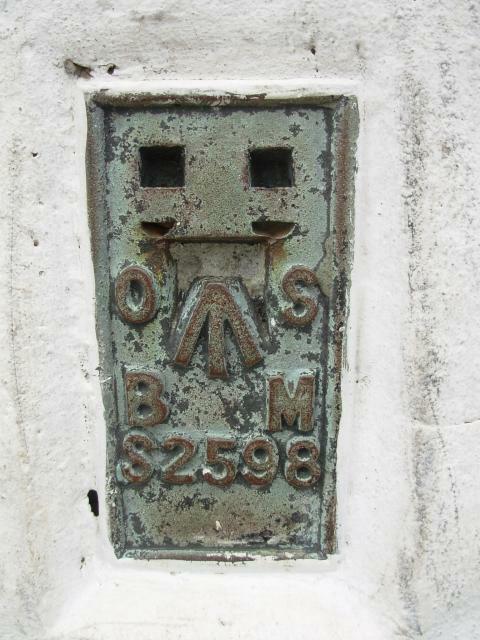 There�s room to park just north of the cattle grid at the bend in the road, north west of the pillar. 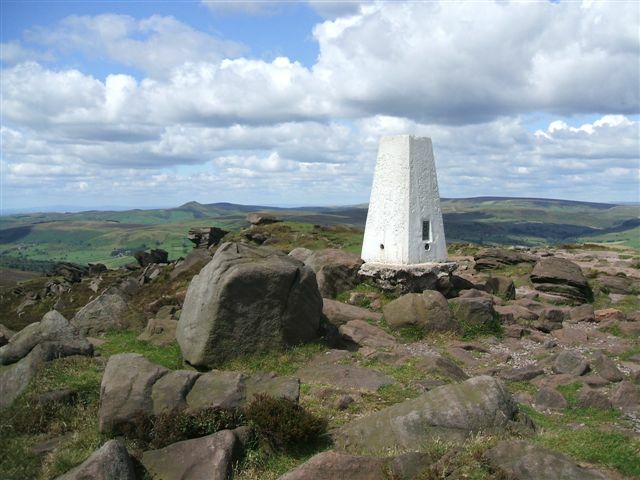 From there it�s an easy climb up to the trig point along a paved path for the most part. 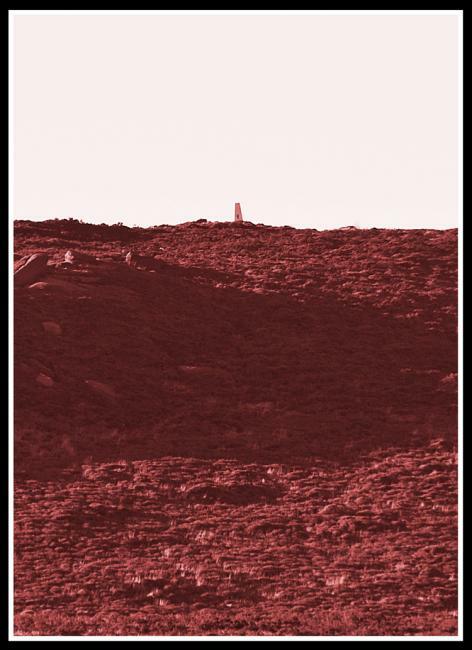 The �ground� around the base of the pillar looks to have been eroded away but I�d be surprised if there ever was enough soil up there for the base to have been covered. 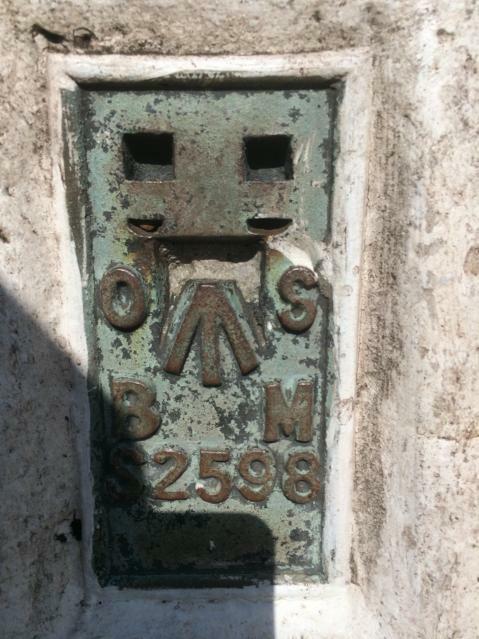 It was probably built that way. 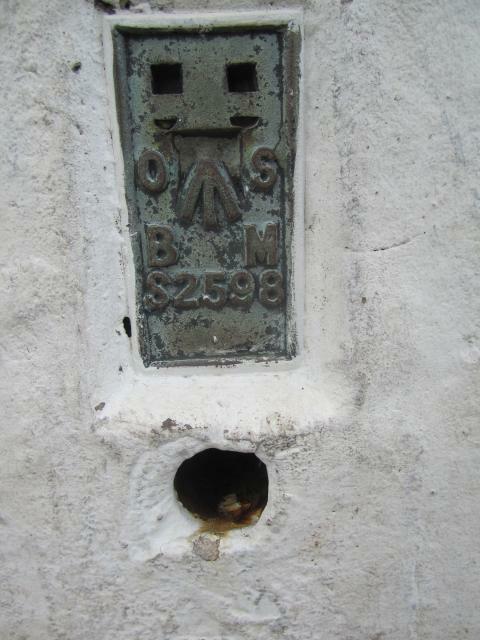 The pillar is painted white and in good condition, apart from the missing centre plug. 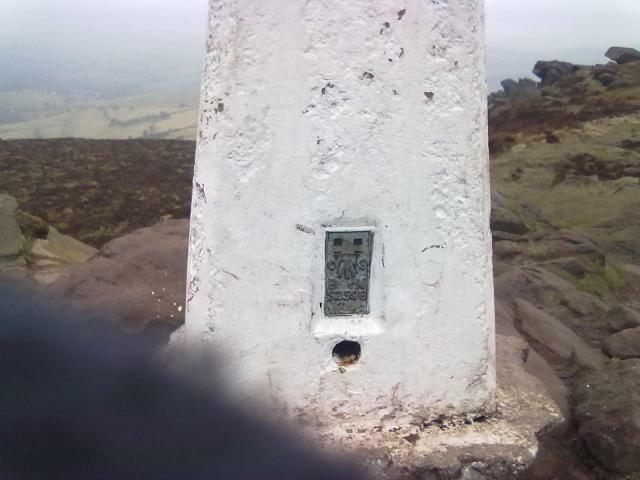 At a recorded 1685ft above sea level, this is the highest trigpoint of my 2 day sortie into the West Midlands. 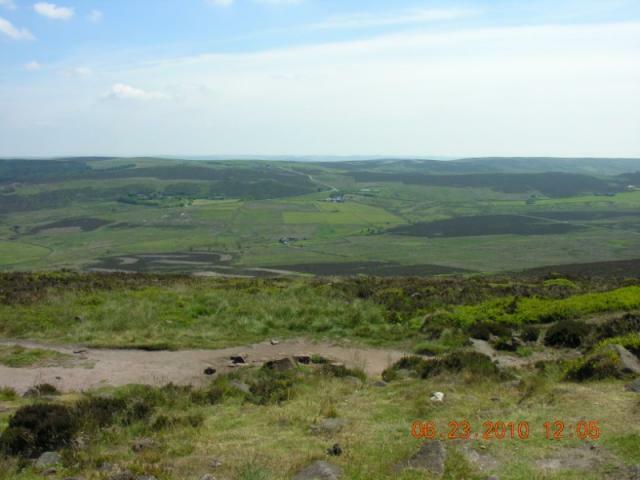 The views are spectacular� or would be if it weren�t so hazy. 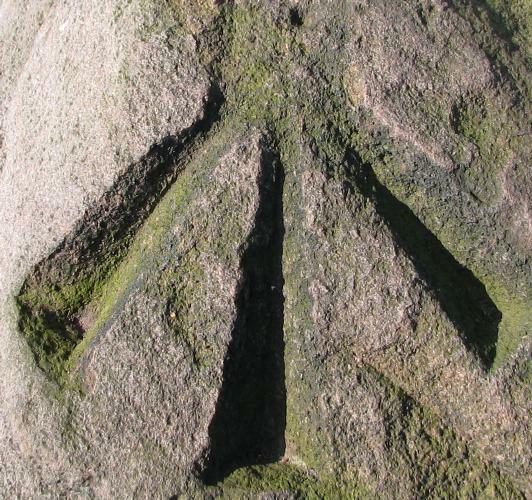 Interestingly, there is a large benchmark arrow incised into a boulder close to the pillar. 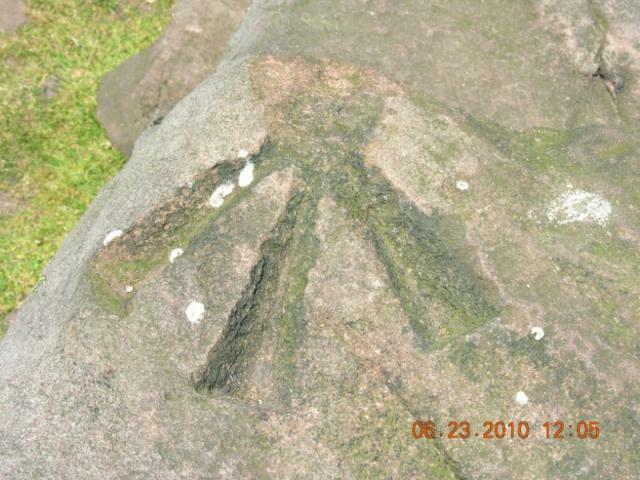 Evidence of an earlier triangulation, maybe? 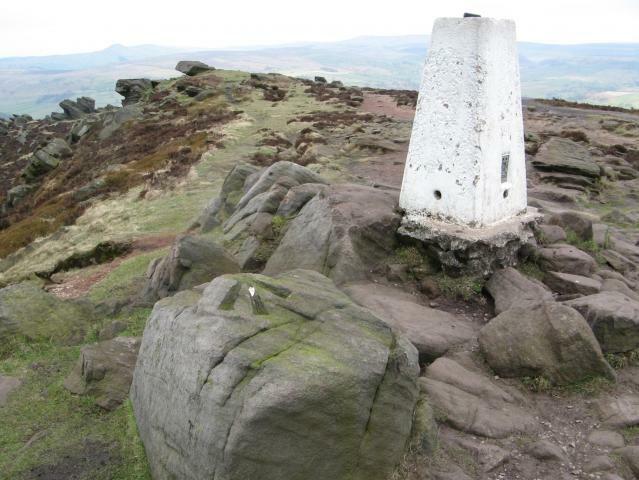 Pathfinder Guide - Peak District Walks (2008): The Roaches & Lud's Church. A bit of an overcast day but a great location. 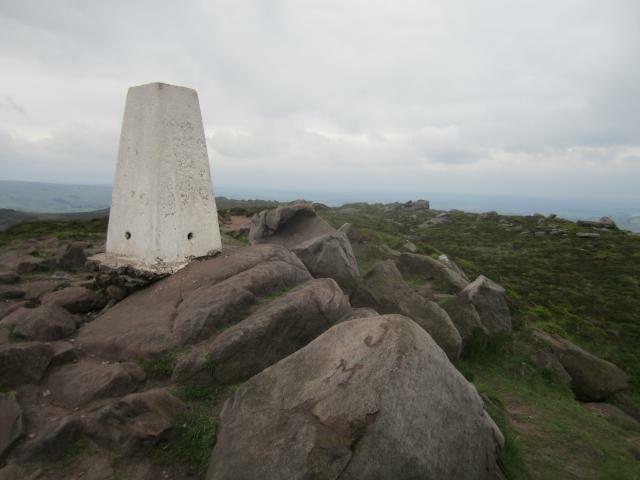 First time walked the Roaches parked car in roadside parking to the south of trig. 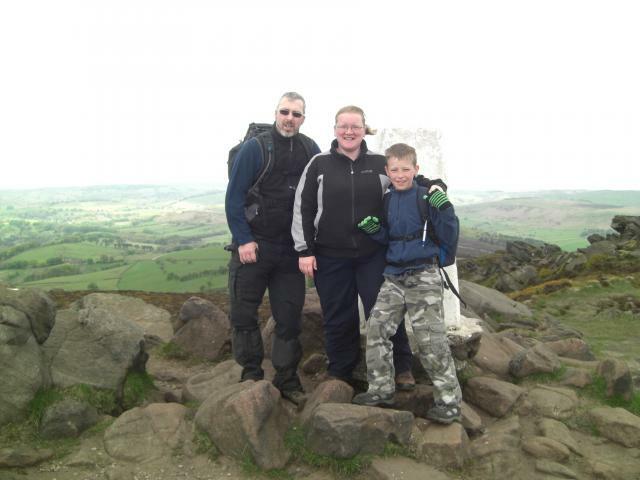 Nice walk about 2 miles with great views over valley. passed Rockhall a house built into rocks. 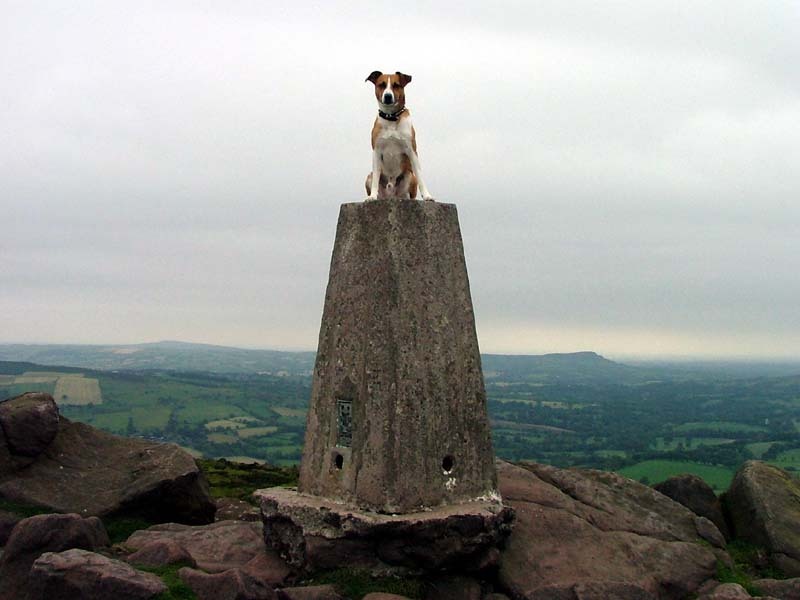 Trig in good condition. 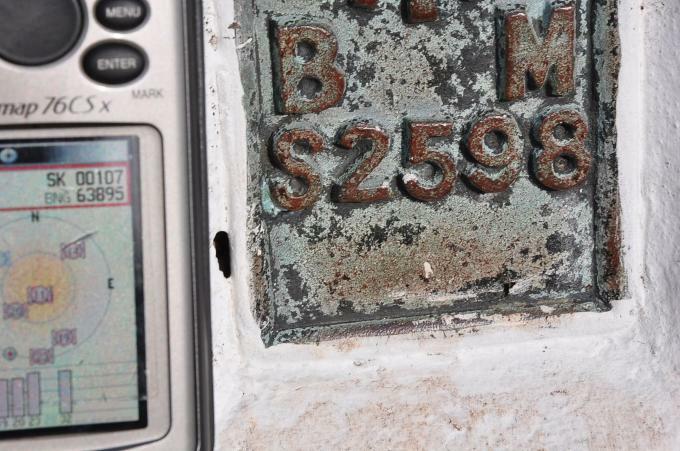 While finding the nearby geocache. It was dark but fun. Visited on a stormy november morning but the visibility was excellent until we set off back and the rain came very heavy. 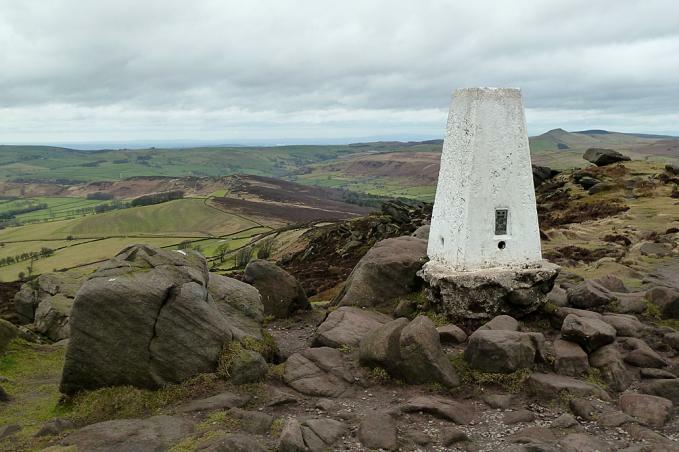 Made it back to the Roaches tea rooms like drowned rats. Lovely area, and TP in same condition as before. Spider is open and the ground is eroding away from the base, but looks like it has had a new coat of paint recently. We should paint them all like this. Splendid views on a lovely evening. 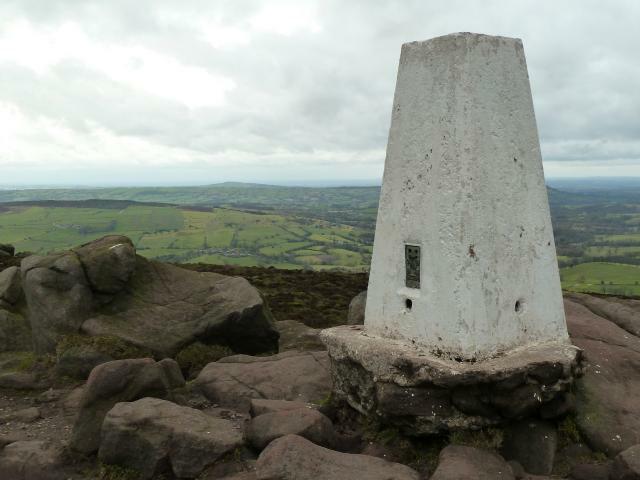 Visited whilst walking with my walking group - The Irregulars, LDWA - on the Head in the Clouds route. Very cold and windy for June. Easy access on foot path. Wonderful views. 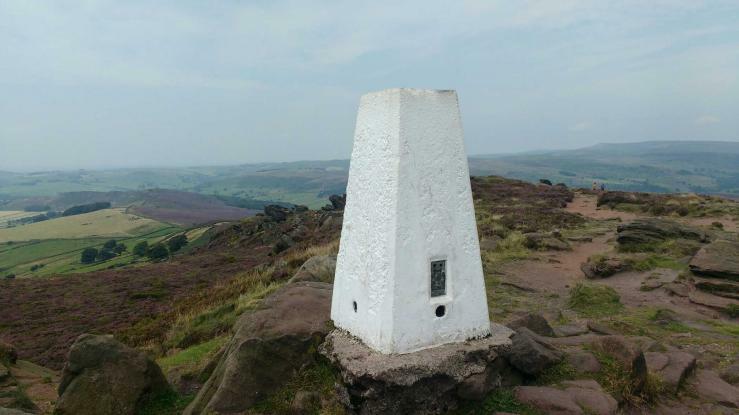 Trig visited whilst walking The Roaches. Great views all around. BUSY! 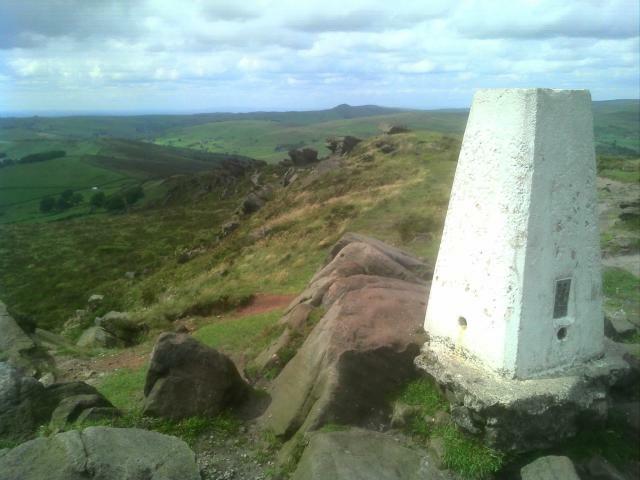 Done whilst walking on the Roaches and doinga bit of caching too. Sun was shining. 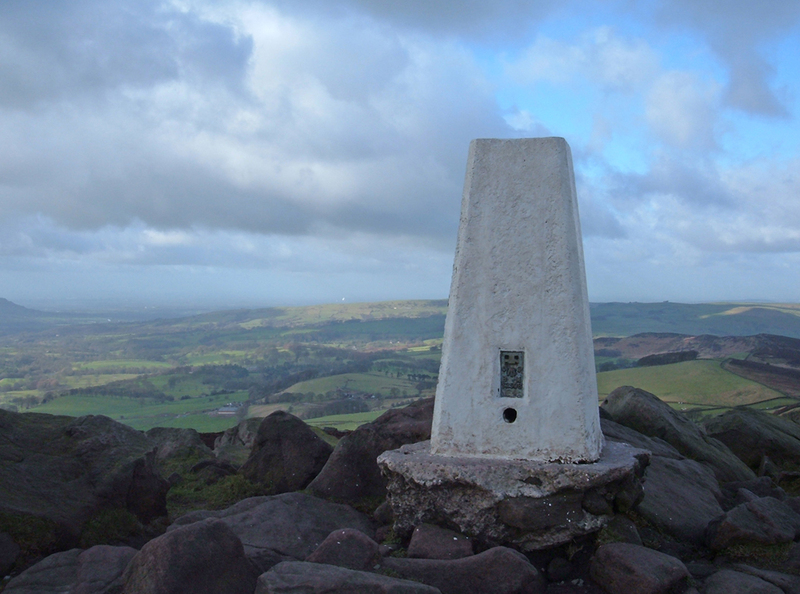 took part in the Roaches Christmas Cracker - some runners went straight past, but bagging trigs is my game. 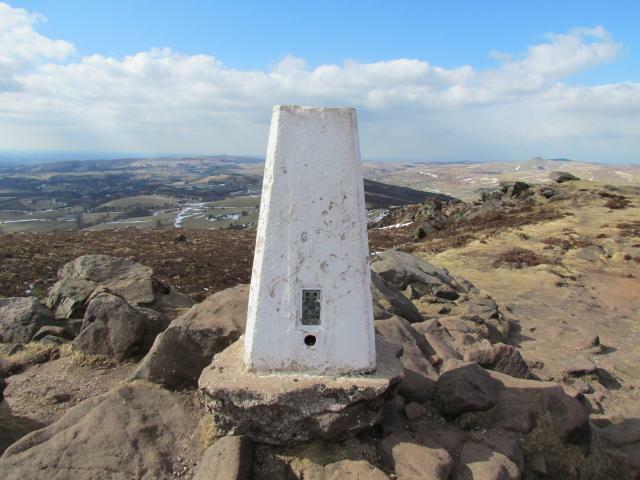 Paint still wet on trig, bright white shining trig could be seen for miles today, fab views & beautiful location. 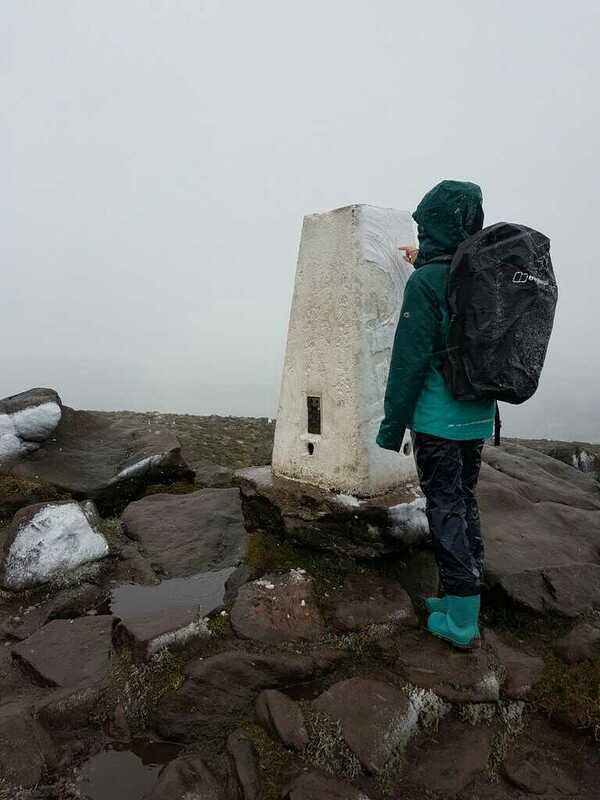 Difficult to walk in a straight line due to the strength of the wind over the ridge! 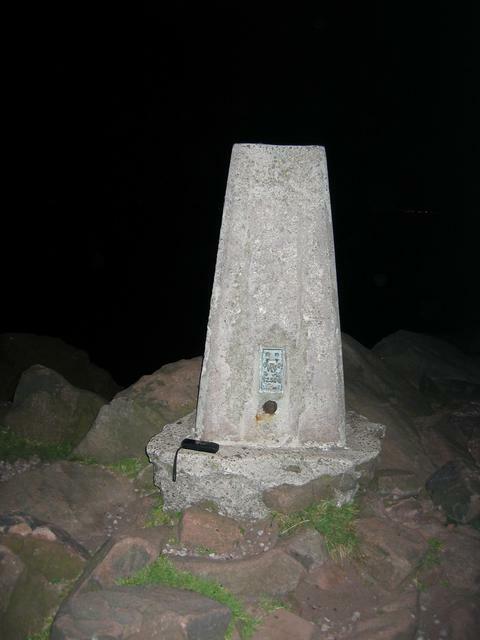 My first logged trigpoint. Visited with friends on a circuit from Rockhall Cottage to Ludschurch and back. 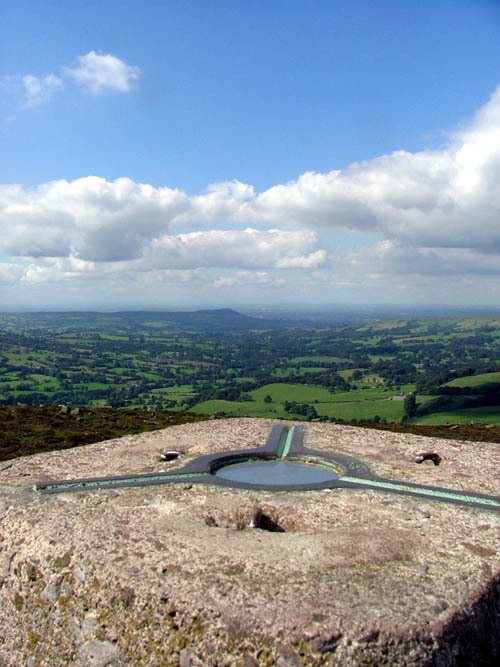 Good perch for views over Cheshire Plain to west. 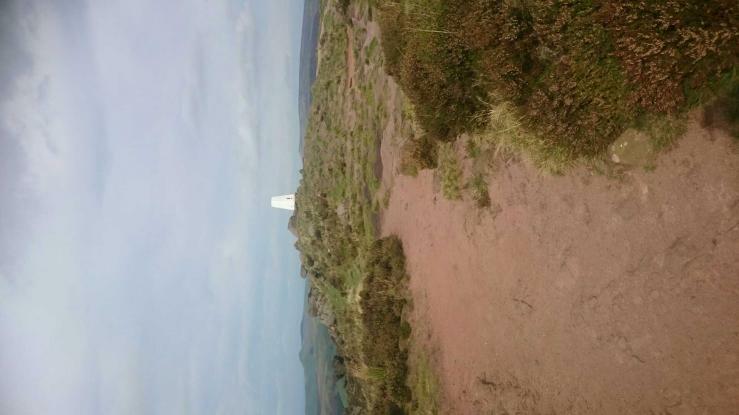 Jodrell Bank could be seen 20 miles away. 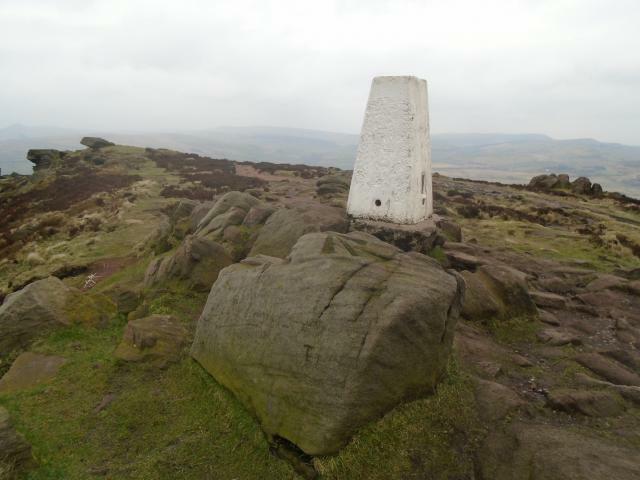 Bagged on a walk from Wincle via Roach End. Built a fantastic little snowman on top of it....but then a child knocked it down. Amazing views all-round!!! Espeially after snow!!! Walked up from the road by Windygates, lots of climbers. 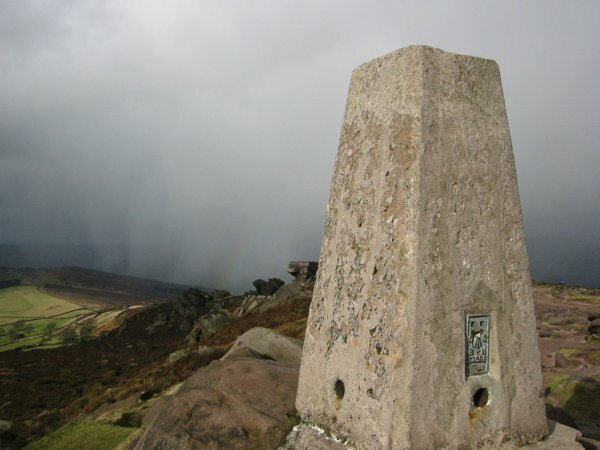 Heavy shower as we set off, but turned out to be quite clear when we arrived at the top. 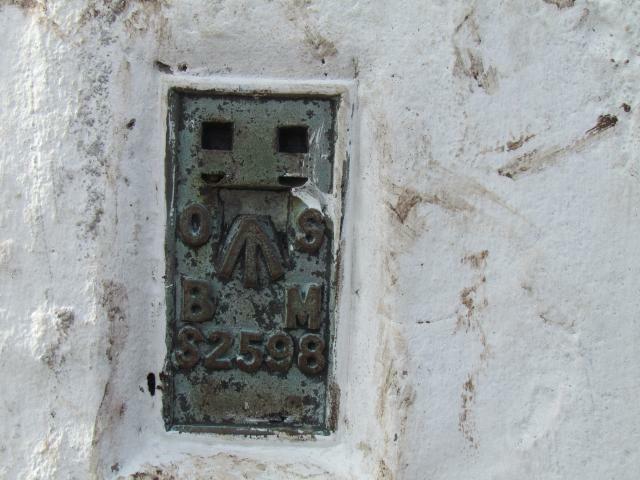 Plug replaced by plastic cover; all sighting holes open but centre mark not visible. 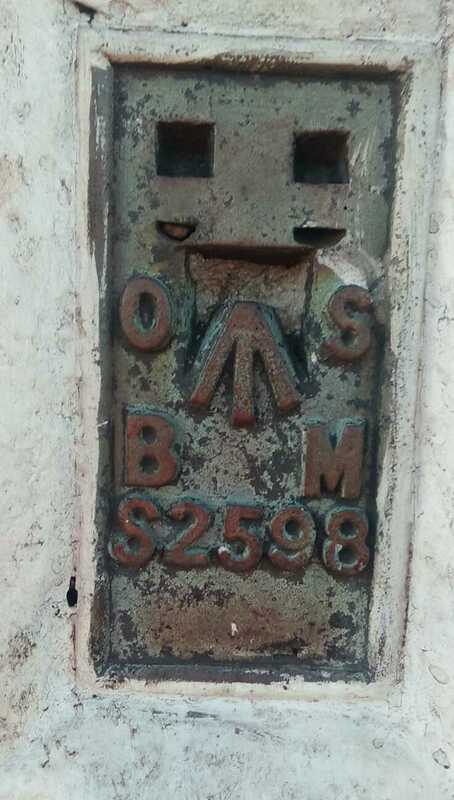 Large cut BM nearby. Hazy views of scattered farmhouses. Interesting rock formations. 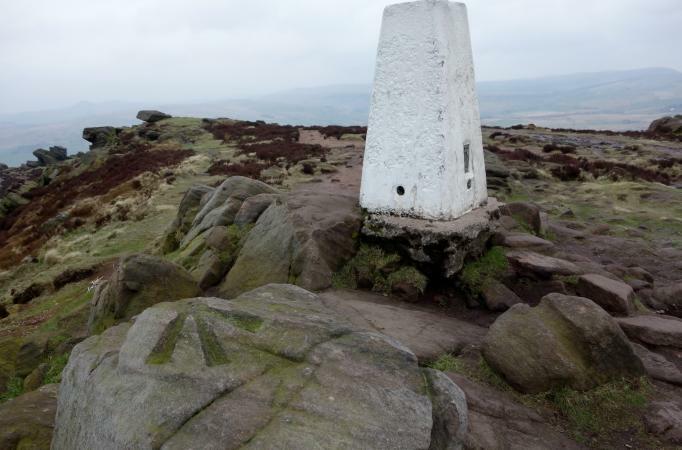 GD place to visit great views and rock formations/edges, although best to be visited early as its like Clapham junction in the afternoon, the trig looks as if its just recieved a new lick of paint which it sticks out from miles away can b seen right from ramshaw rocks, and it looked in gd condition to me. 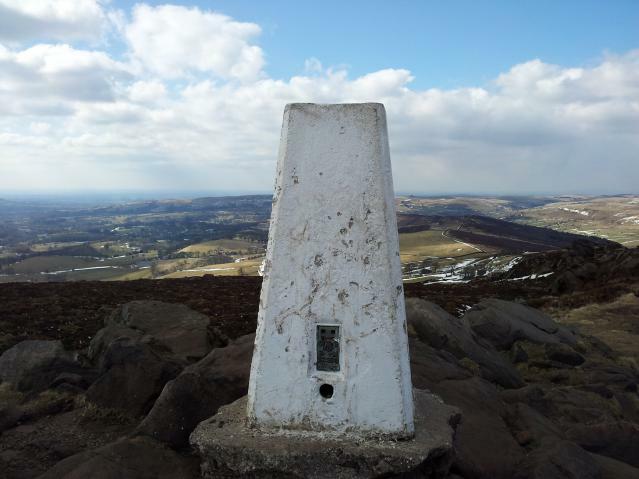 Great trig for a day out. 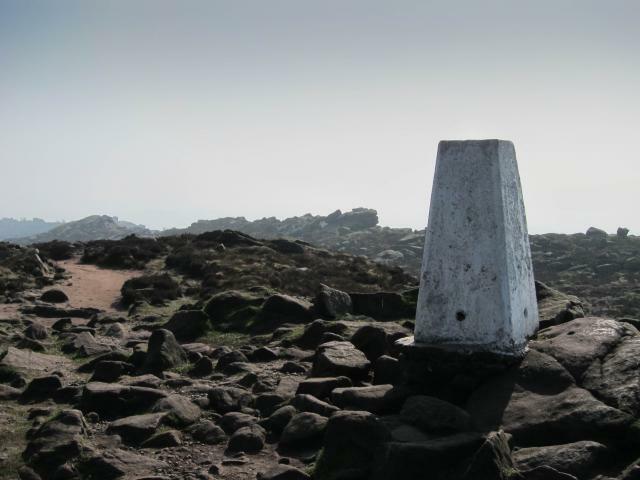 Close to Doxey Pool. Lots of parking on road below Five Clouds, but can get quite busy. 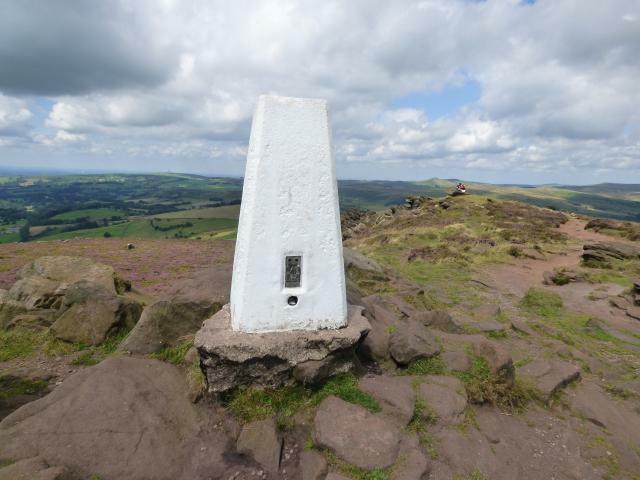 Alternative parking at Roach End (closer to trig) Superb 360 views, Tittesworth Reservoir and The Cloud visible. 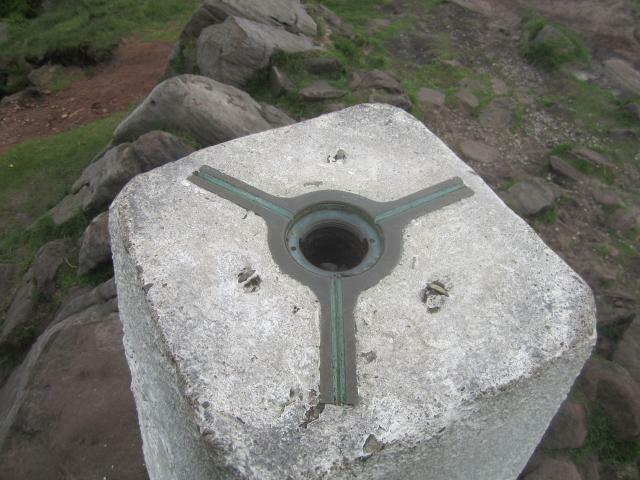 Trig in good condition, worn concrete base. Looks like a recent coat of paint. vgc, white, plastic cap. Just a quick bag from Roach End this time. 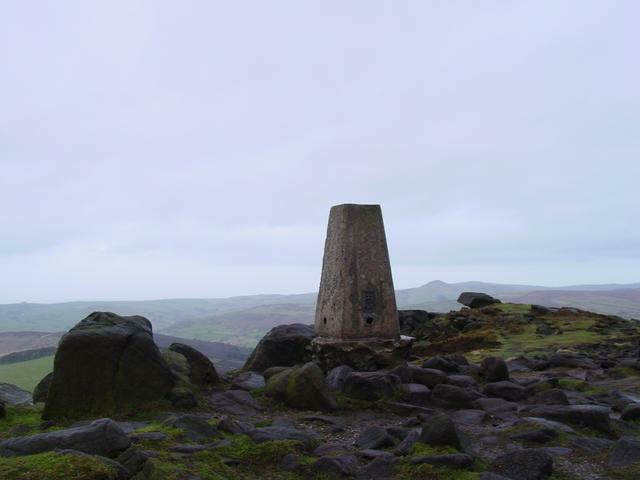 Classic Dark Peak outcroppy summit, v attractive view, stunning sky with weather front just arriving. 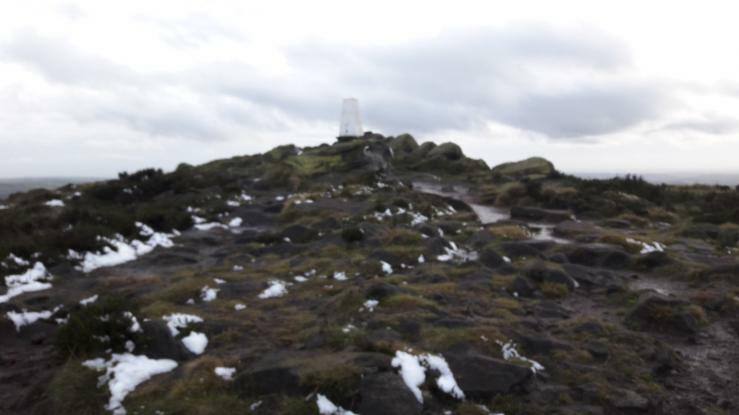 Howling wind and snow just starting to fall didn't detract from the great views and then up to Lud's Church for the "Wow!" factor. 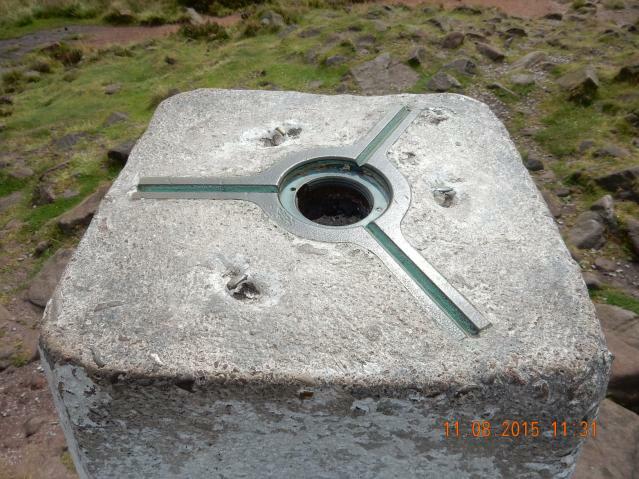 Pillar itself seemed to be in good condition, plastic plug intact, some paint and no major damage, plinth is a little eroded, but no worse than many other "good condition" trigs IMHO. 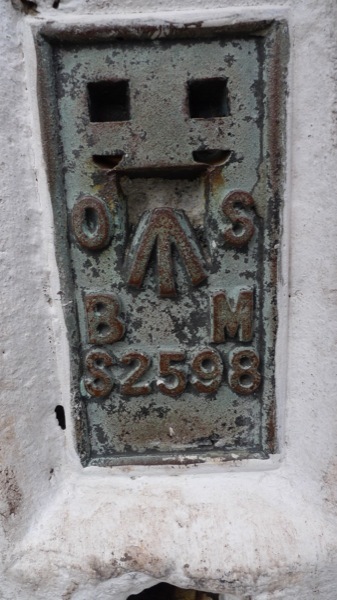 Visited the pillar then onto the cache. 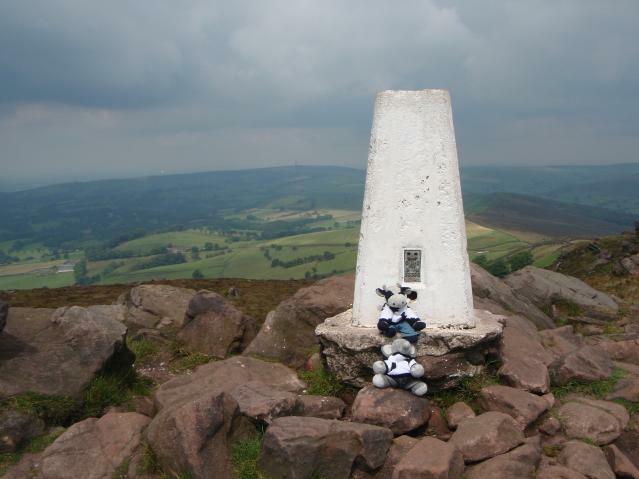 nice walk but farther ted (superted on geocaching) beat me to it. 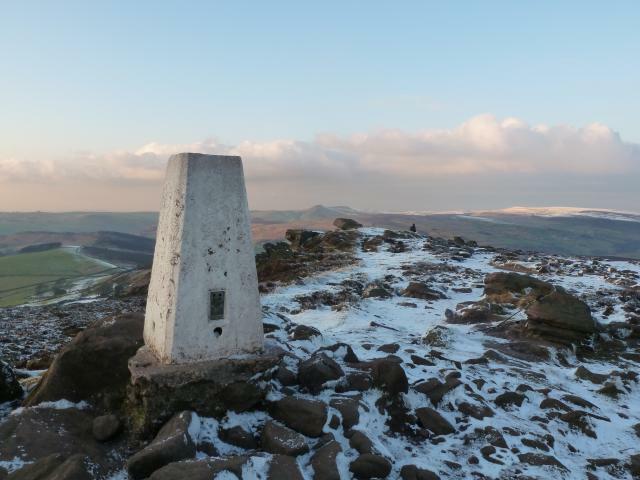 I'd hired out Gradbach Youth Hostel for our traditional January trip for 60 of us. 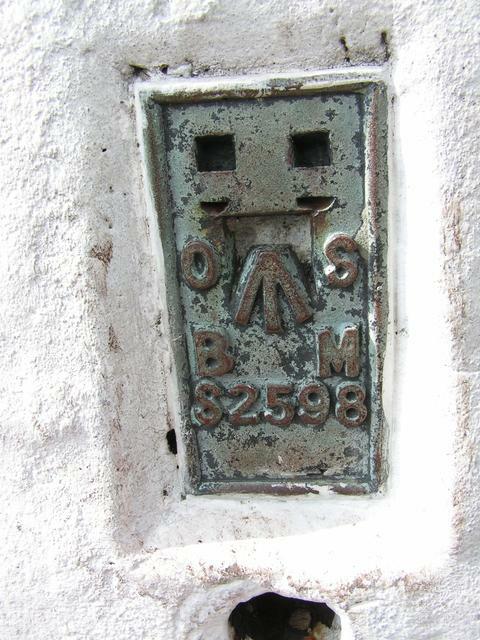 A group of 13 of us walked up from the hostel on this fine and sunny day, but only me took a photo of the flush bracket! 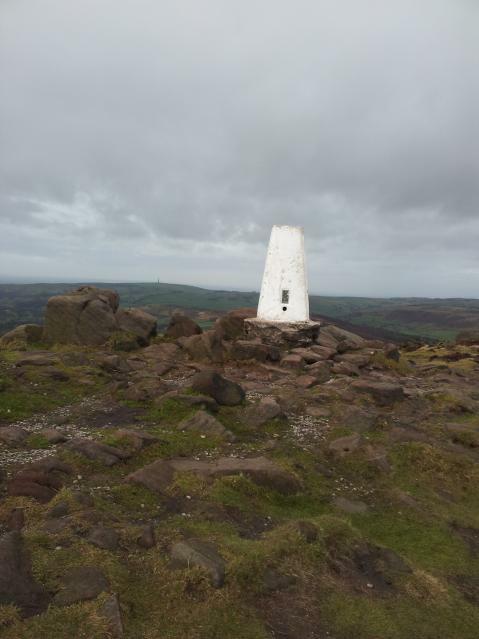 Lovely 10 mile walk around The Roaches and Hen Cloud, bagged Gun trig on drive back. Not a Wallaby in sight! Pleasant walk bit busy .Views still v misty. 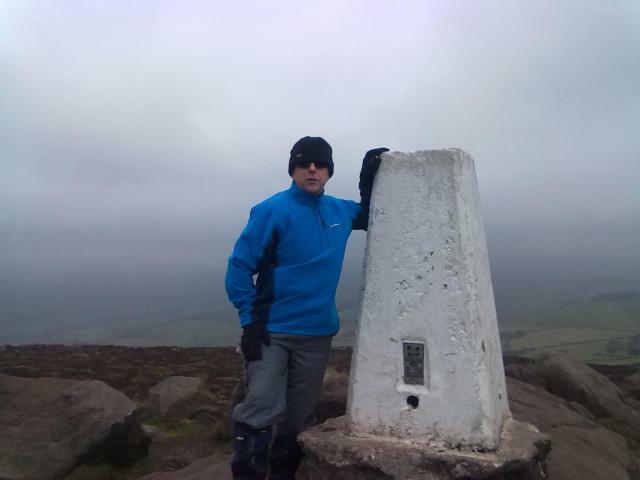 Quite cold in the wind along the ridge, but worth it for the experience. 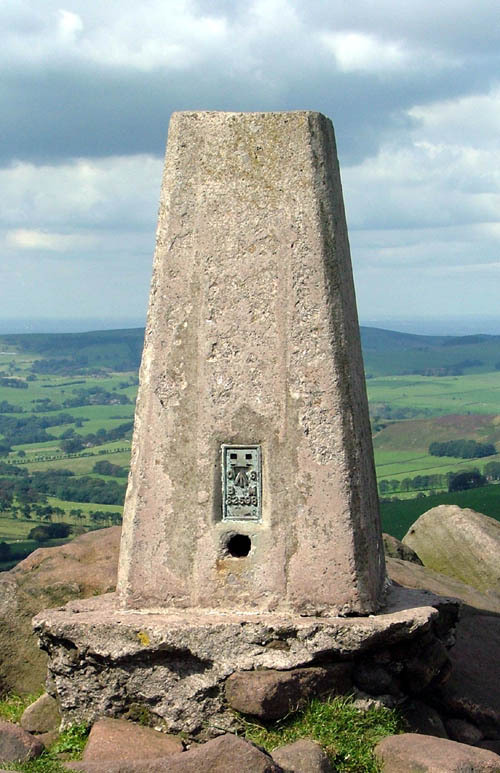 It's windy up here Trig point showing views over the Cheshire Plane. Easiest access is from Roach End. Very windy on visit. 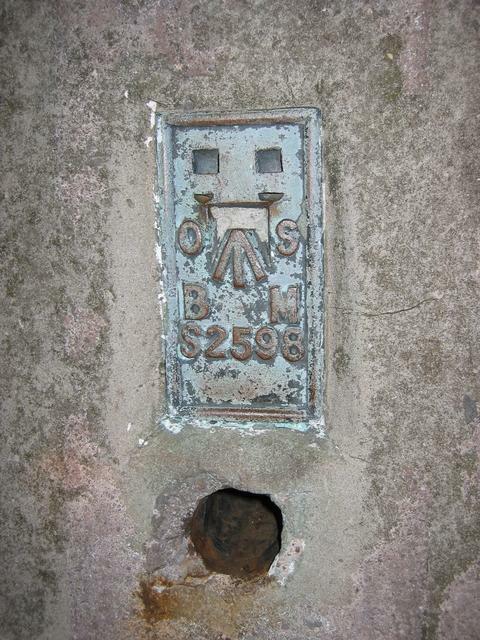 Base of trig point eroded. 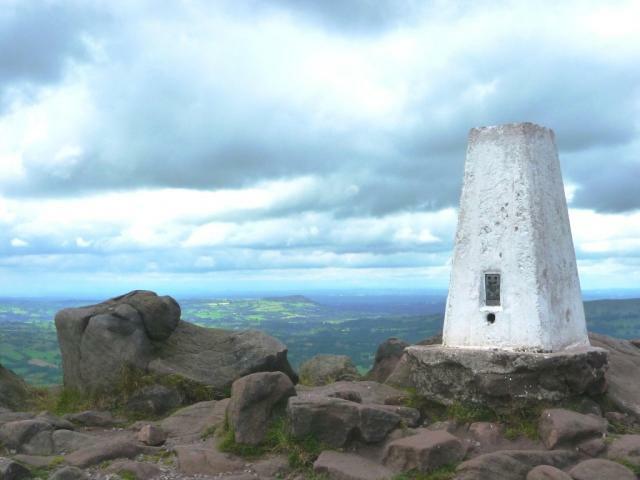 (Numerous visits to this summit as close to home). 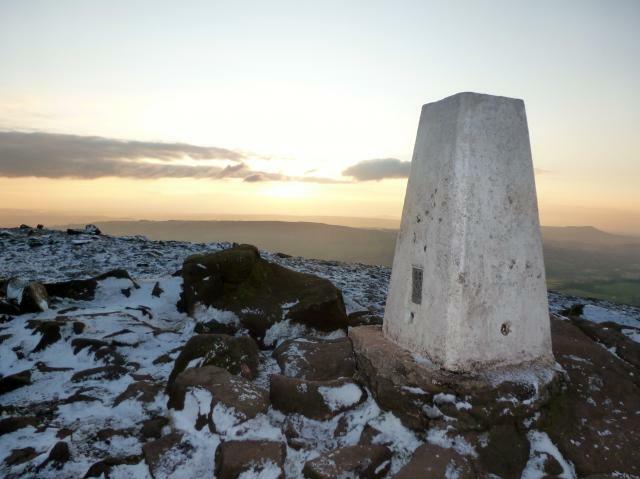 My twelfth visit, but the first in snow (first visited 18 July 1989). Aggregate rather than concrete. 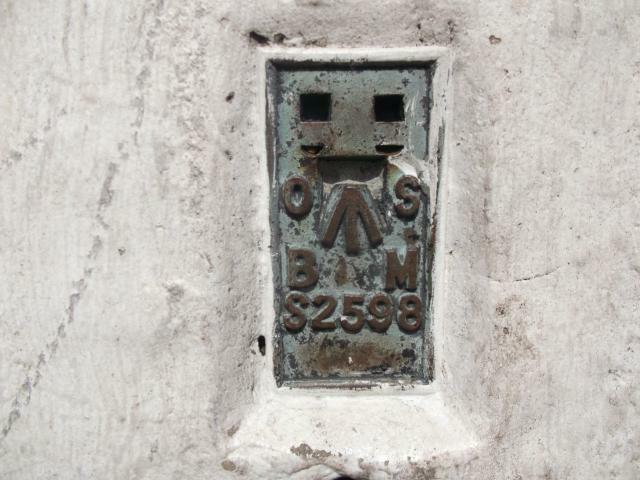 Plastic plug. 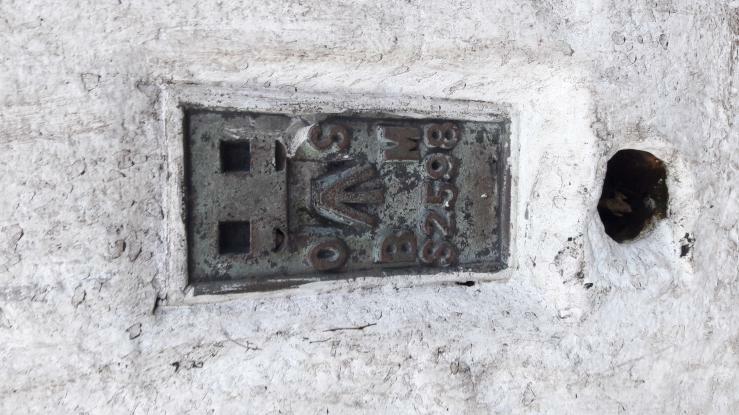 Concrete plinth eroded. 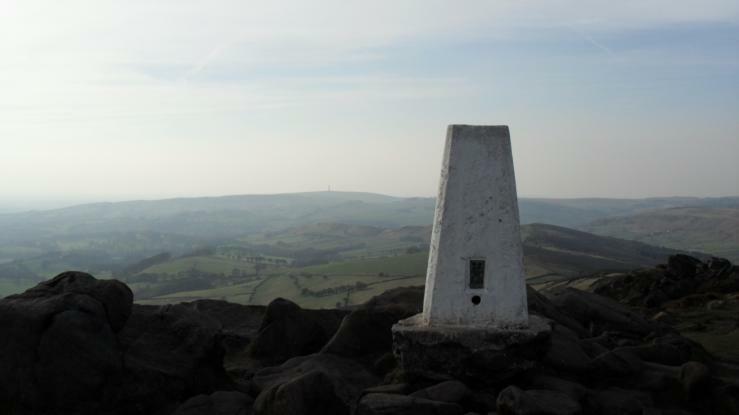 On the popular Roaches ridge with excellent views of Tittesworth Reservoir and Leek to the South. The base is slightly damaged. 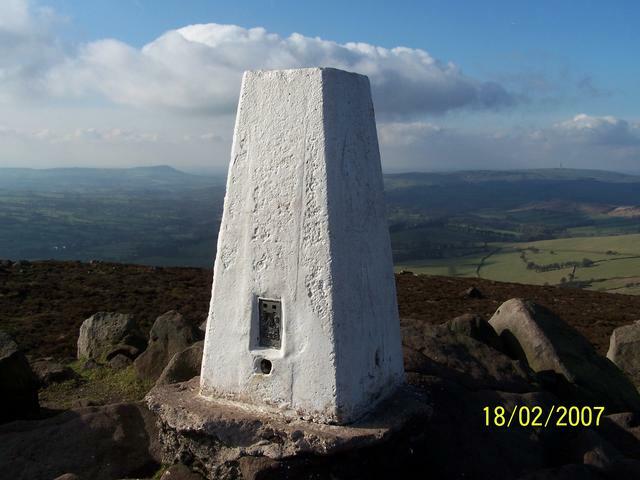 Visited the trig point on a circular walk from Leek. 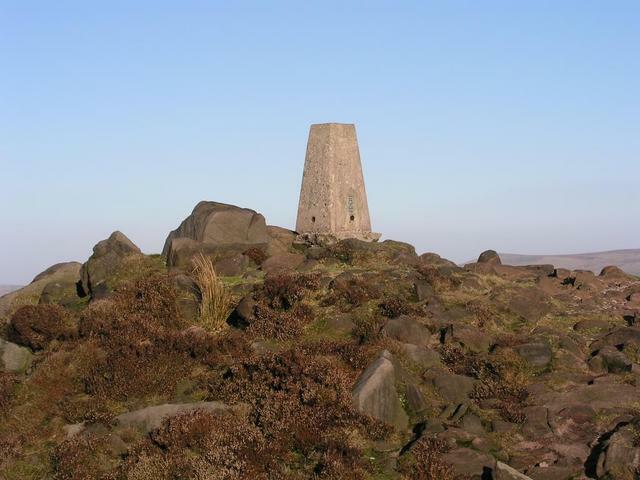 The Roaches are beautiful, even in the winter sunshine. 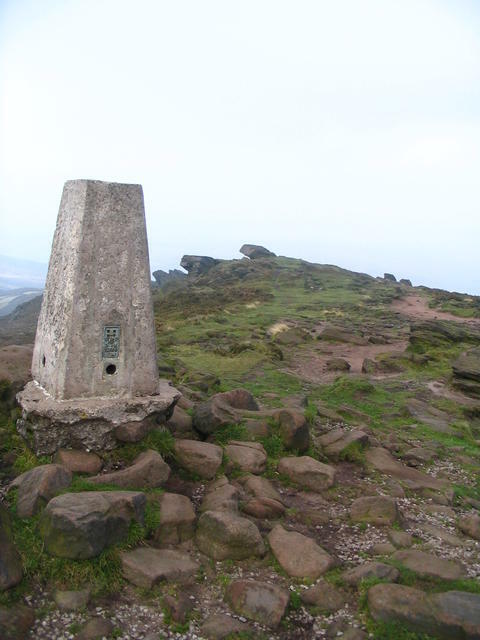 A footpath runs right past the pillar, which is at the southern end of the hill ridge. 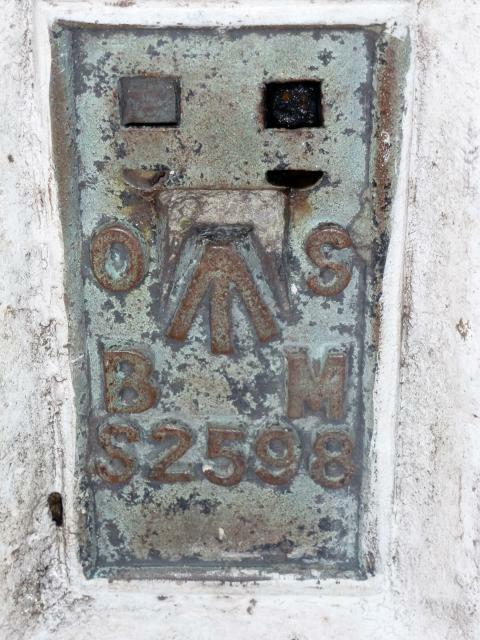 Bonus - this is currently also geocache GC45CC (moves around from trigopint to trigpoint). 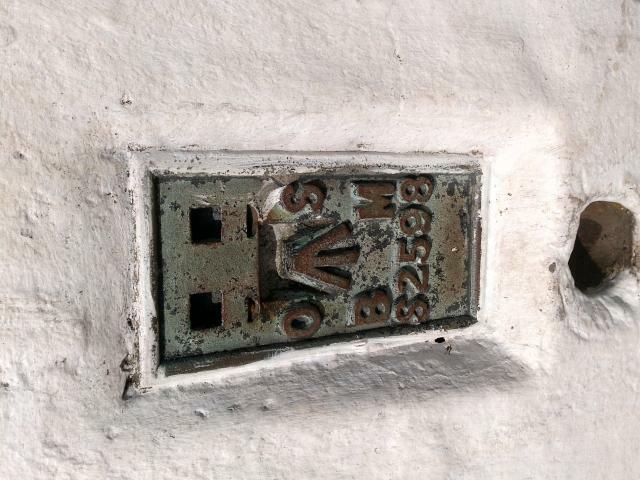 Missing centre plug. Nice views from here, even at night. one of my favourite places for walking been past here many times. 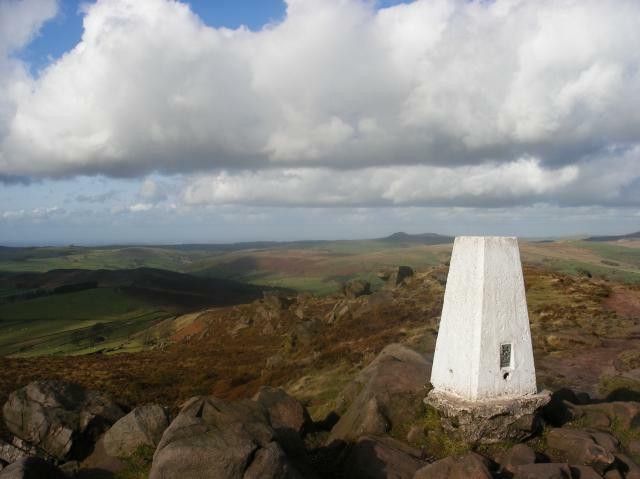 Loverly views but can be windy at times.this was the first trigpoint I ever logged................... 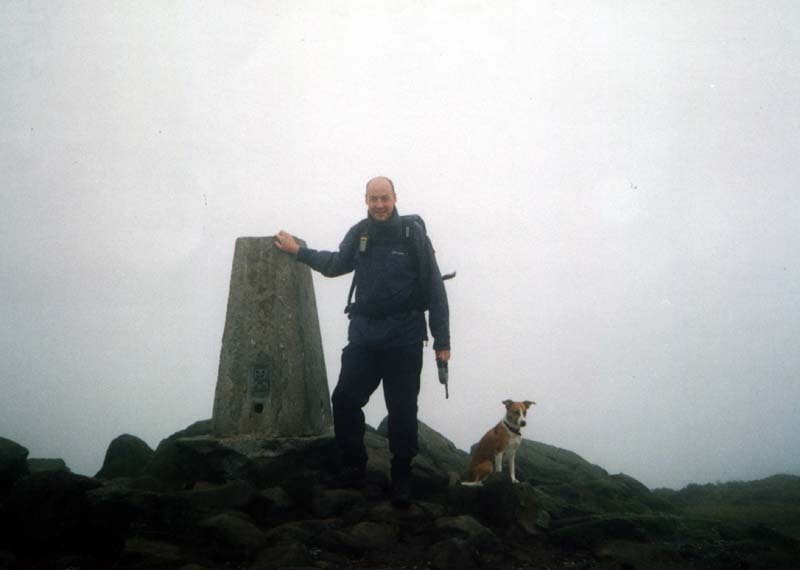 REVISIT 06/09/03 Nice walk past the trig...........................REVIST 25/10/03 Very misty today on top here placing My nearby cache staffordshires highest cache..................REVISIT 31/8/04 Here to change the log sheet.................11/06/05 To check the cache. nice here today. 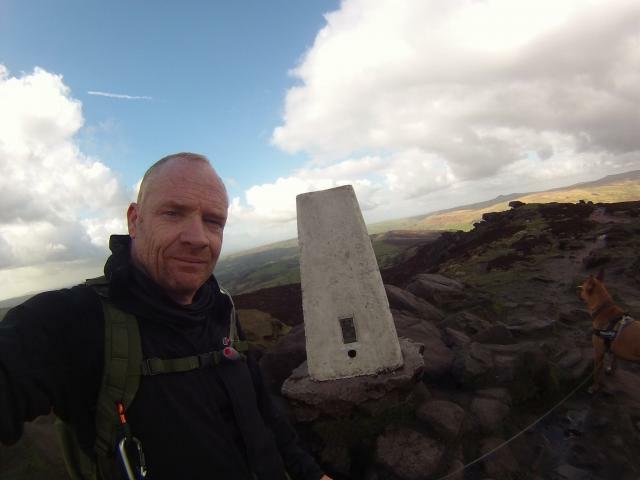 Great walk over the Roaches and onto Luds Church on sunny afternoon. 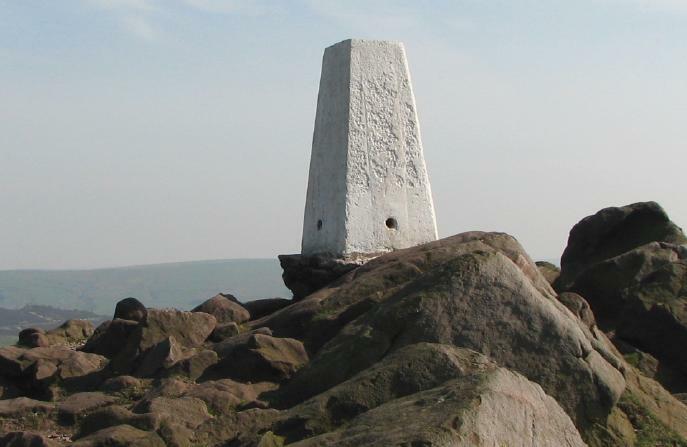 Often been busy at the southern end of the ridge, but have walked past the pillar,pool and other delights of th Roaches skyline a few times. No wallabies though. 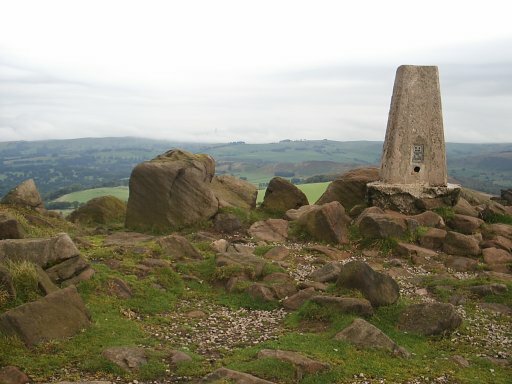 Came past here during a fell race. 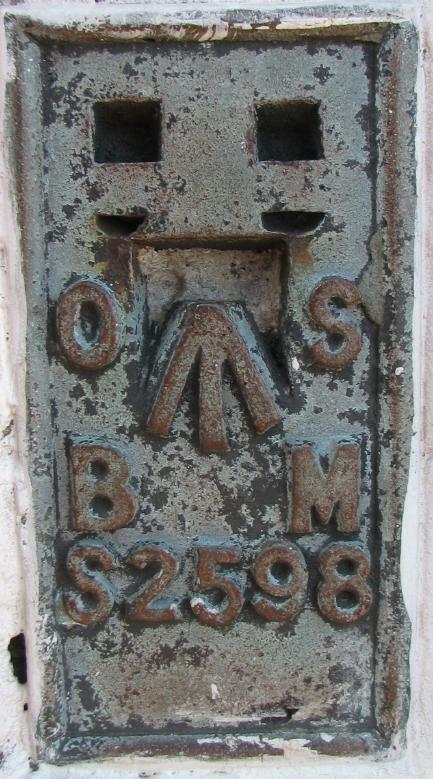 Staffordshire. Checkpoint two on the Octavian Droobers night race. 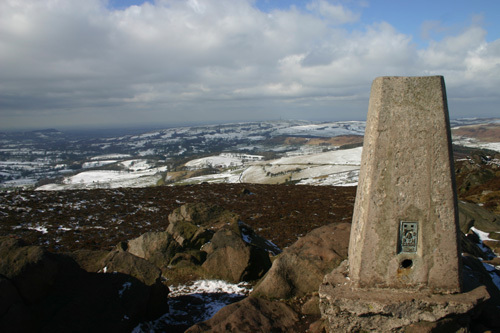 Also here on 22 Nov 87, the actual date of the fell race, mentioned in next entry by Desperate Dan.